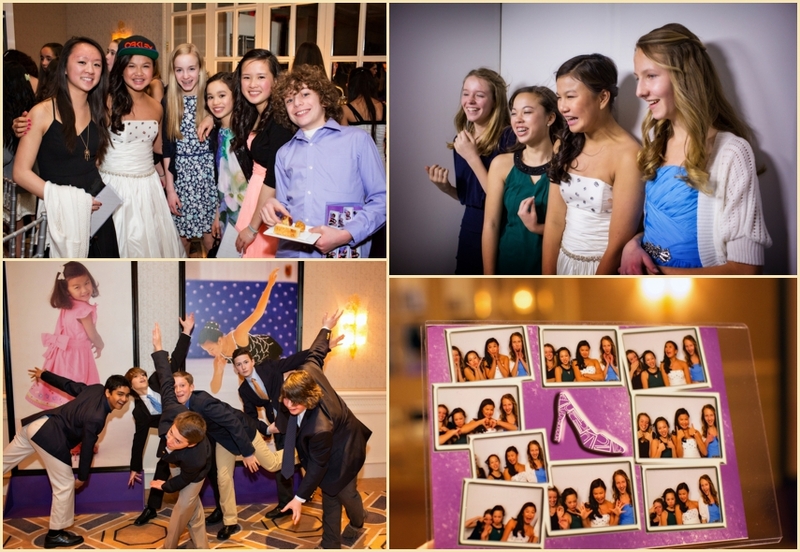 Last weekend we had the pleasure of photographing a beautiful Bat Mitzvah at the Four Seasons Hotel Boston, designed and planned by the always fabulous Hopple Popple Events. 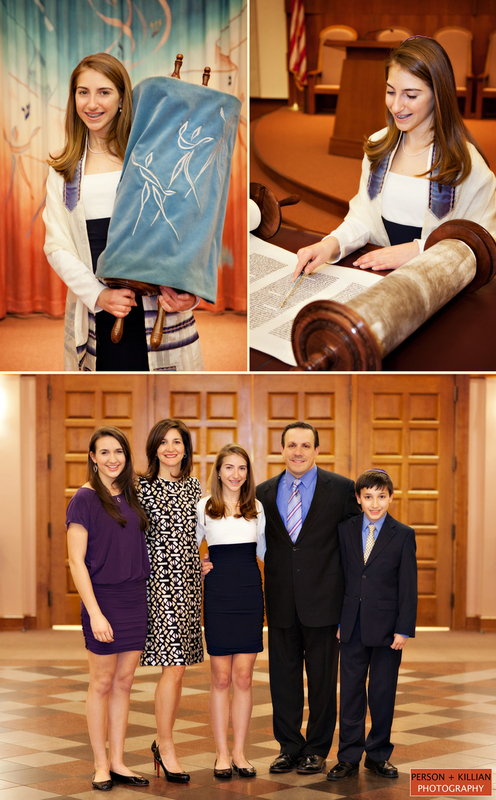 We joined Lily and her family at Temple before the service on Saturday morning for some portraits. 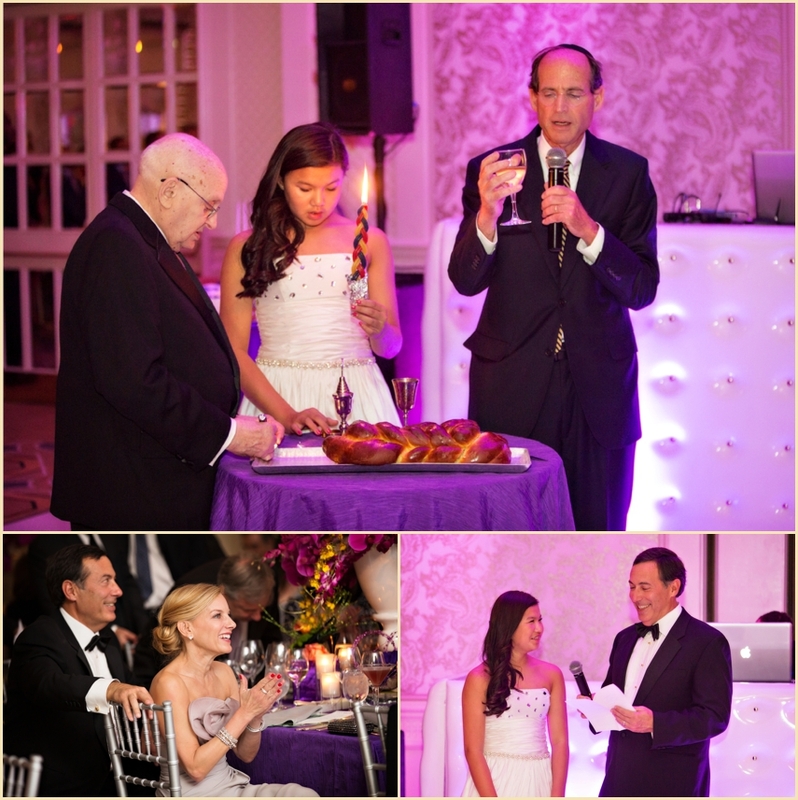 That afternoon, we rejoined Lily and her family at the beautiful Four Seasons Hotel Boston for her Bat Mitzvah celebration. 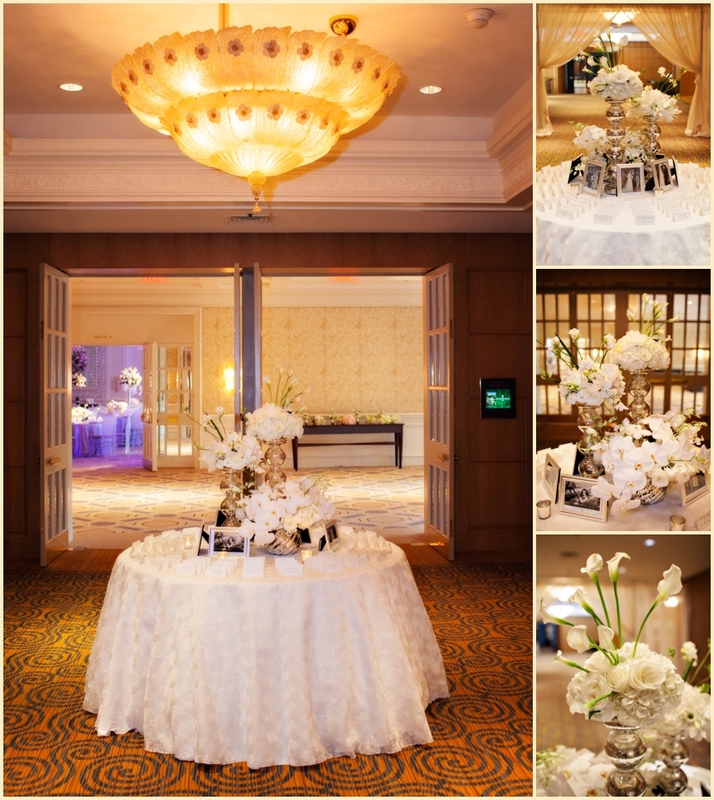 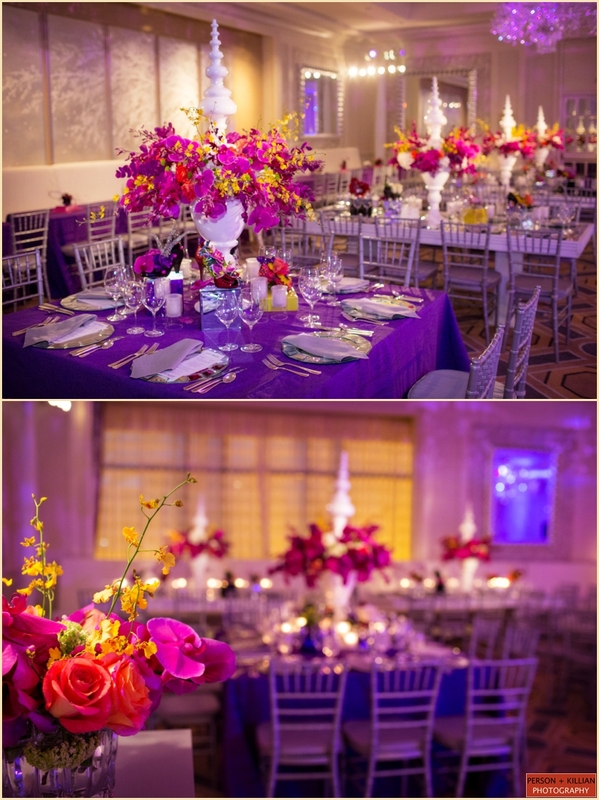 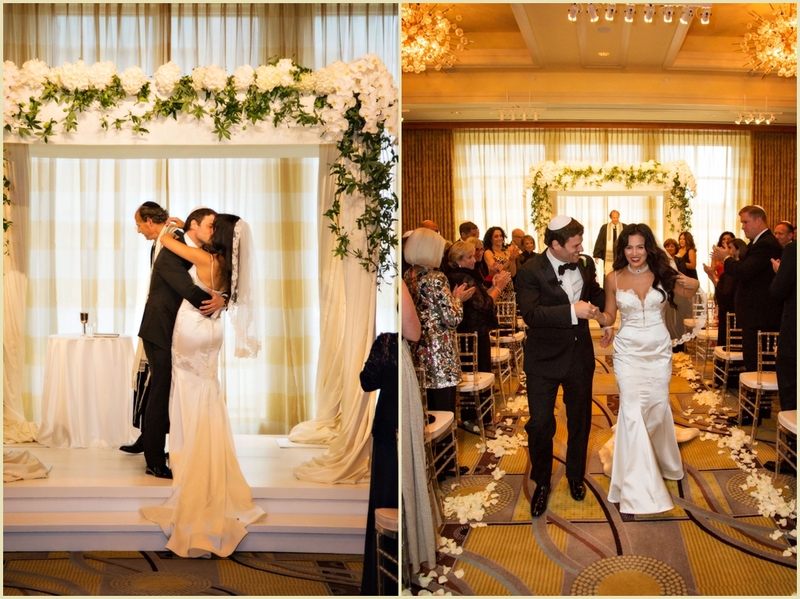 The Four Seasons ballroom was transformed for the big day, with colors and themes designed especially for Lily. 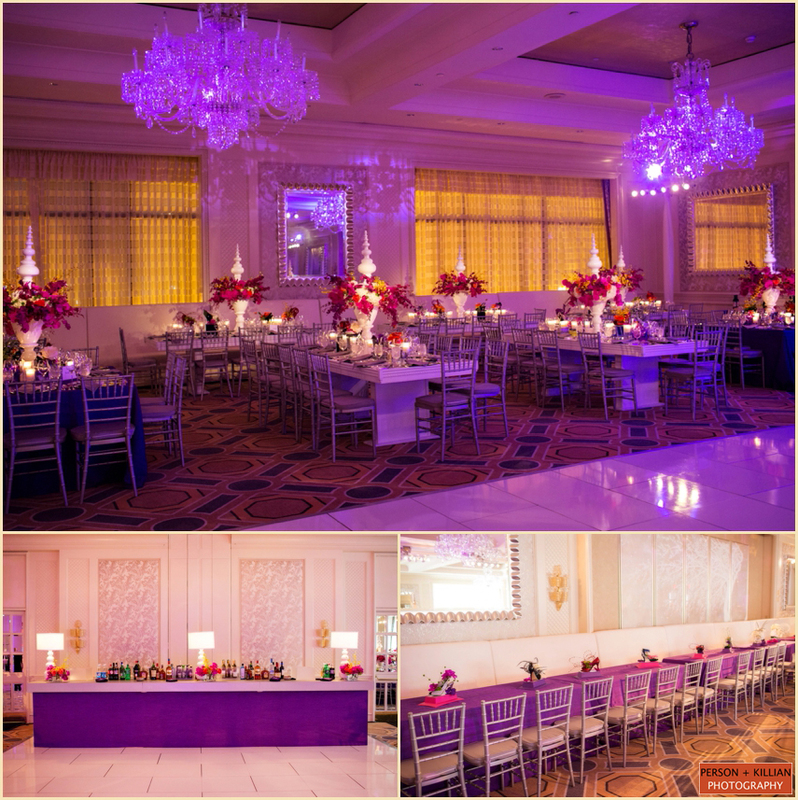 A mix of elegant white-mirror top tables and bright purple linens surrounded a sleek all-white dance floor in the middle of the ballroom, and each table was topped with a beautifully colorful floral arrangement. 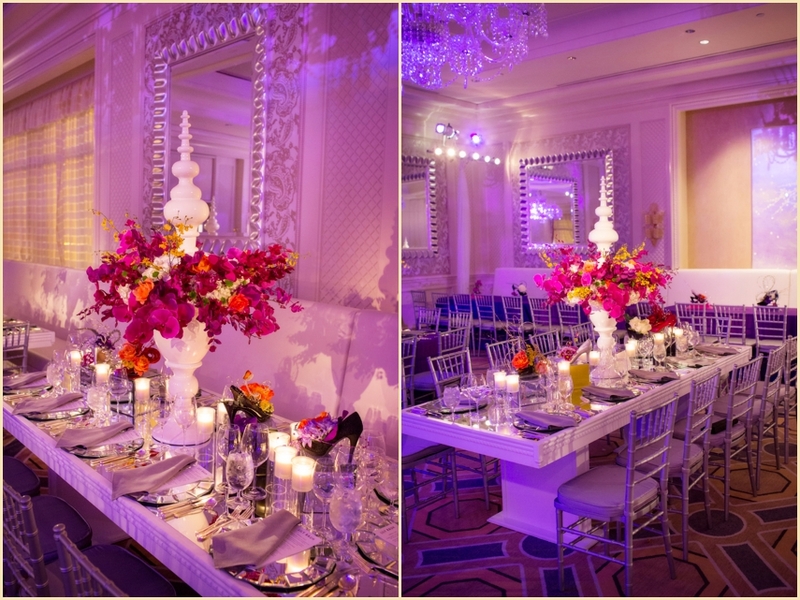 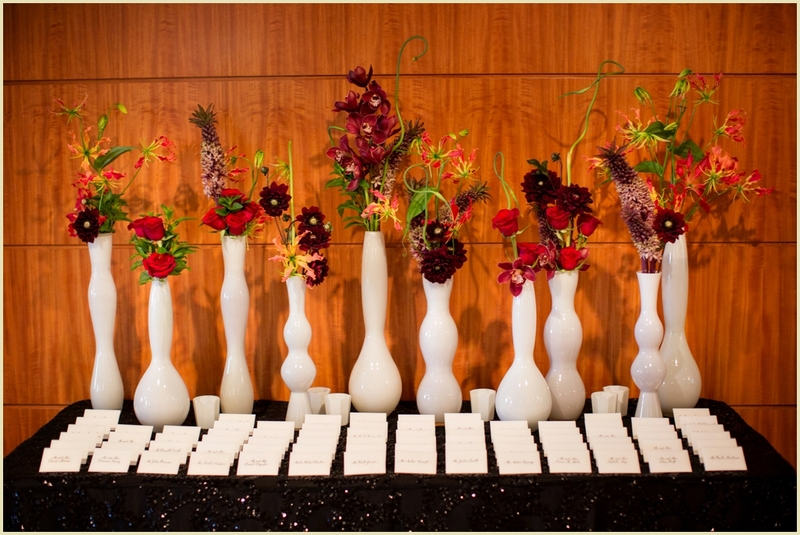 The mix of pink, orange, and yellow flowers gave the room a great pop of color, and we loved the unique white vases that displayed them all. 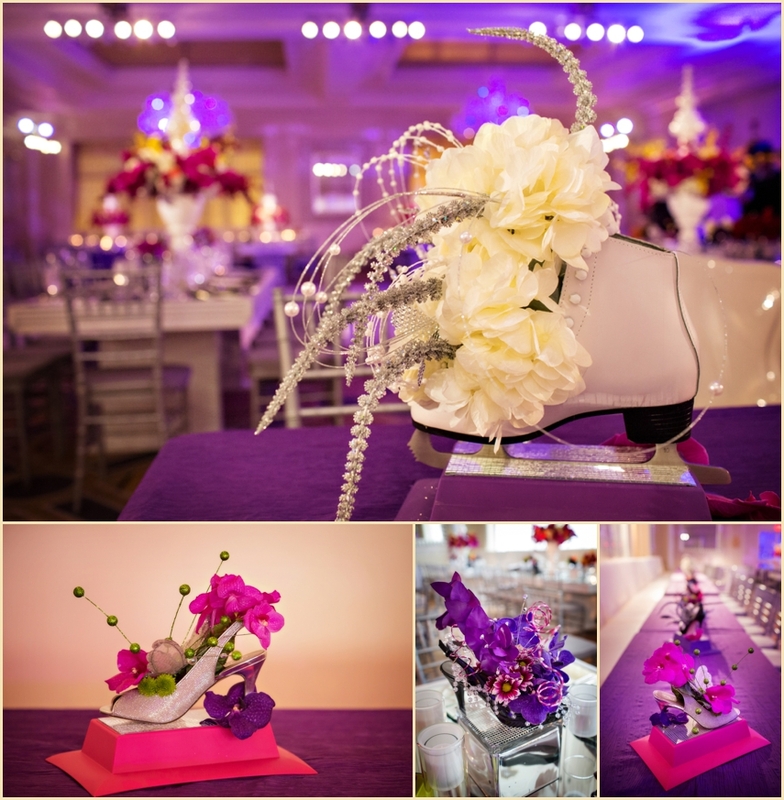 Each of the tables also featured custom-designed floral arrangements inside sets of totally fashionable high heels. 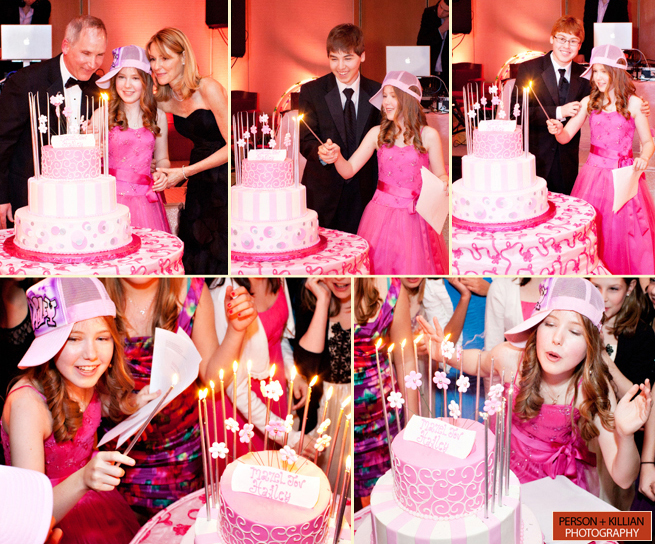 Lily is a huge fashionista, and these special centerpieces were a surprise just for her! 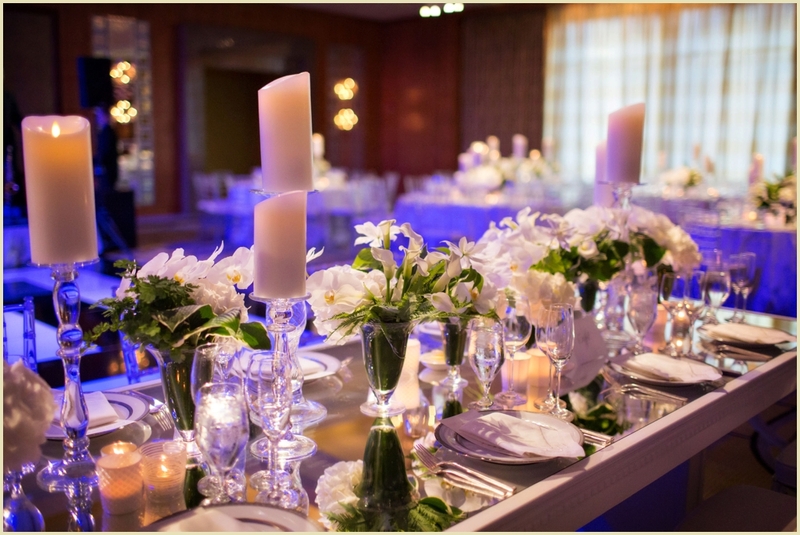 Lily’s own table featured a special set of ice skates filled with custom white and silver flowers, to celebrate Lily’s many years as a figure skater. 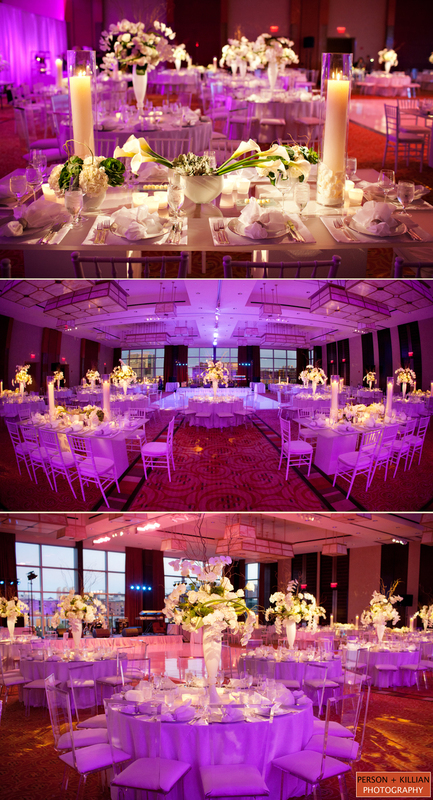 Once the sun started to set, the ballroom was washed with colorful purple up lights and the tabletops were lit with soft candles for a beautiful warm glow. 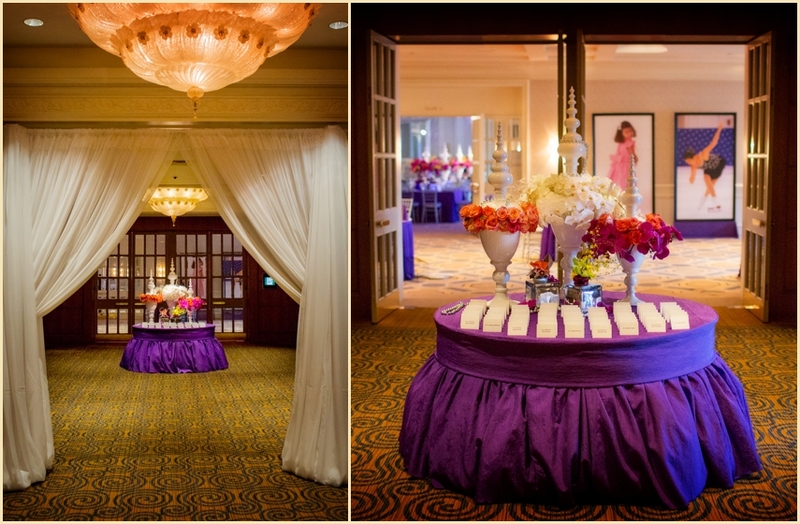 Even the crystal ballroom chandeliers were purple to match with the rest of the decor! 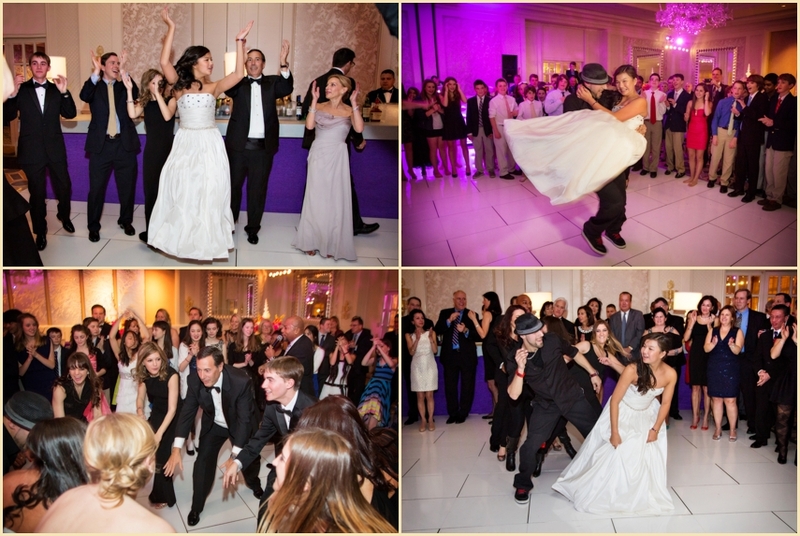 Guests enjoyed a fun photo booth, delicious food, and non-stop dancing to celebrate Lily on this very special day. 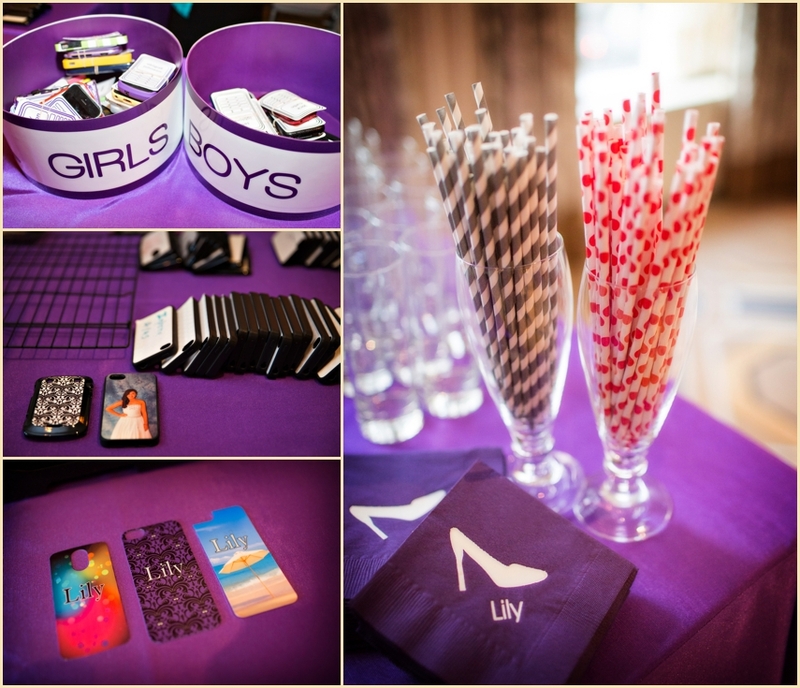 At the end of the night, everyone was treated to churros, a make-your-own sundae bar, and berry-topped bites of chocolate mousse served in mini chocolate high heels! 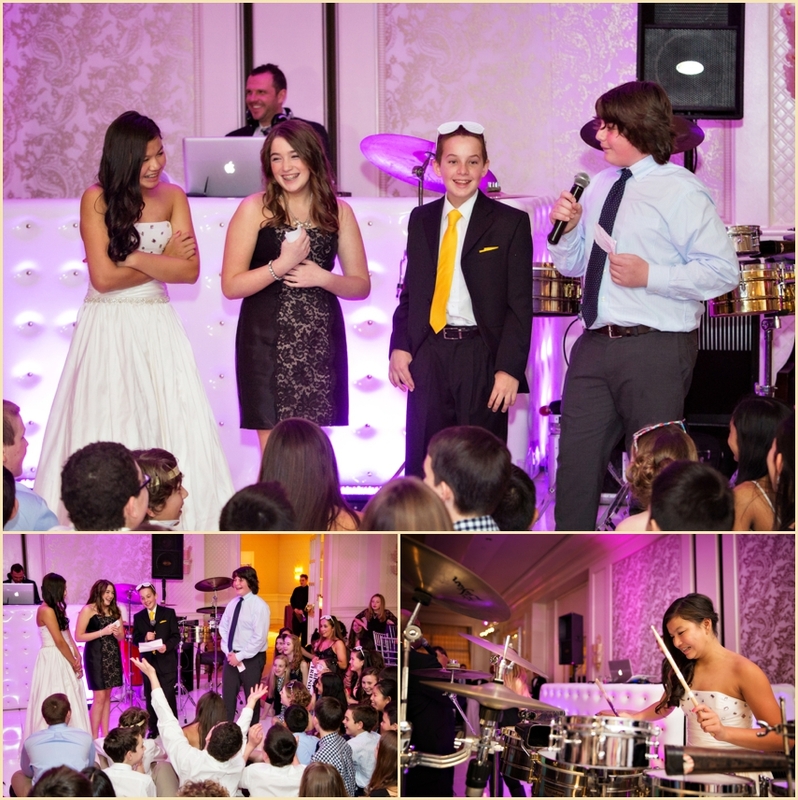 We had so much fun sharing in this celebration with Lily and her family. 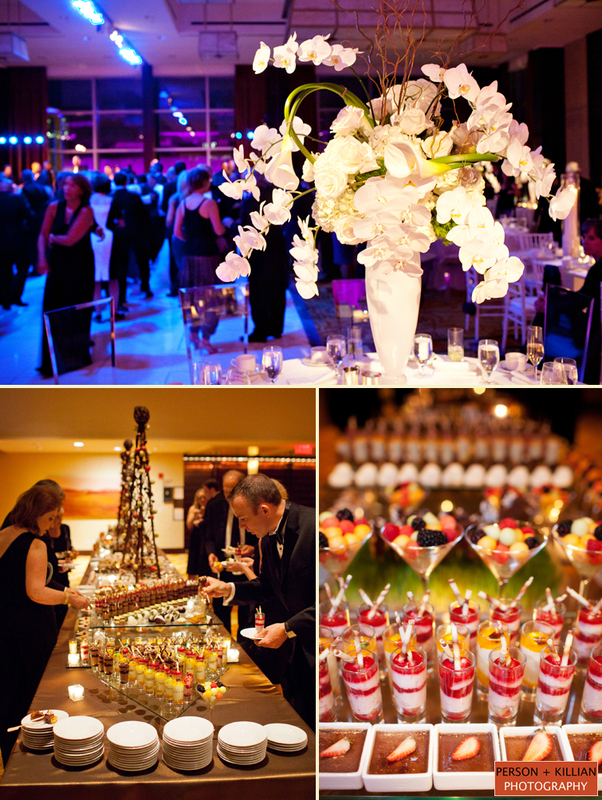 Special thanks to Hopple Popple Events and the entire team at the Four Seasons for a fabulous night! 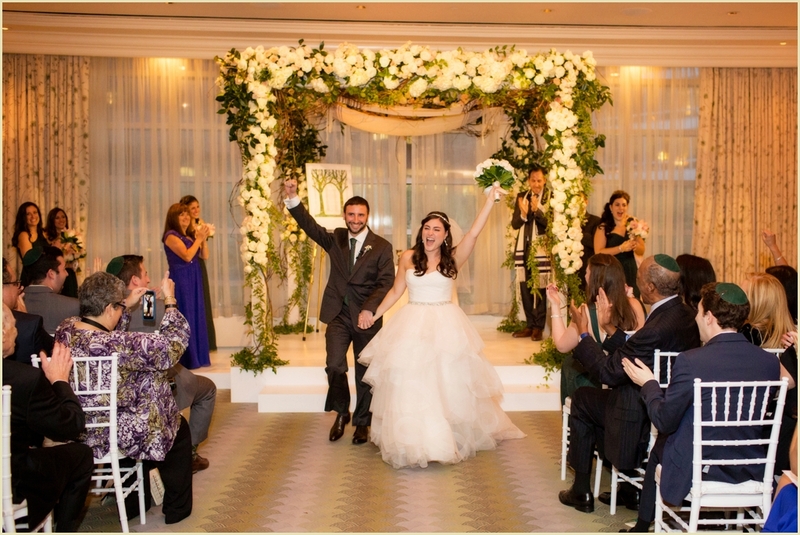 Mazel Tov, Lily! 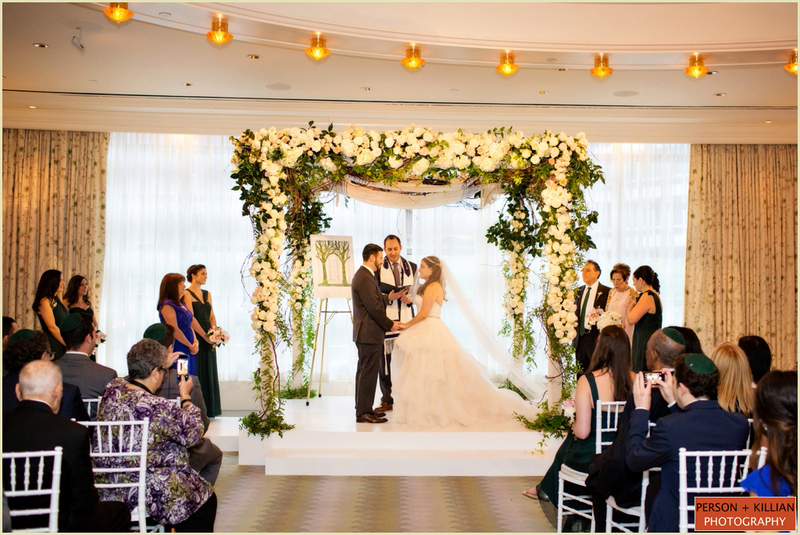 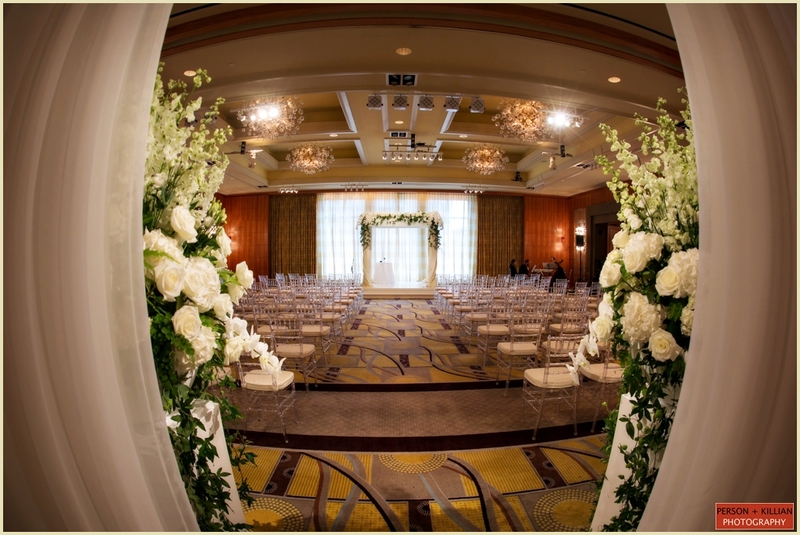 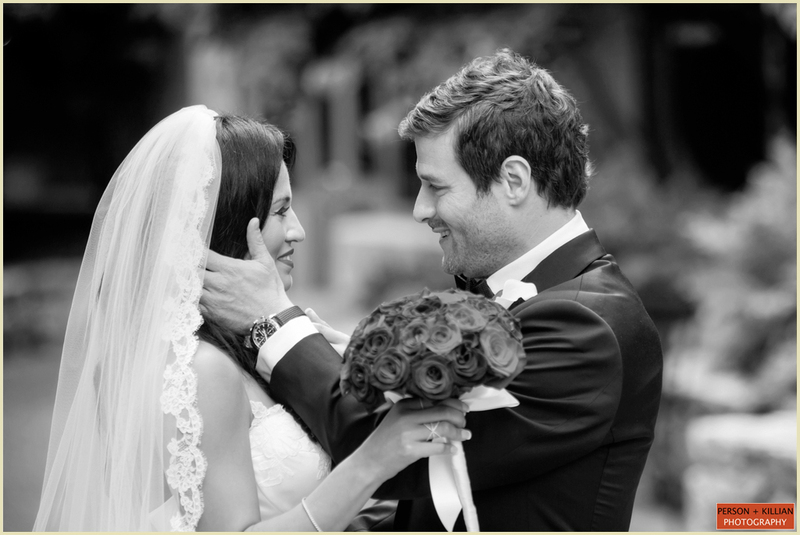 The Four Seasons Boston is a perfect venue for couples who are looking for a classic, elegant, traditionally beautiful wedding. 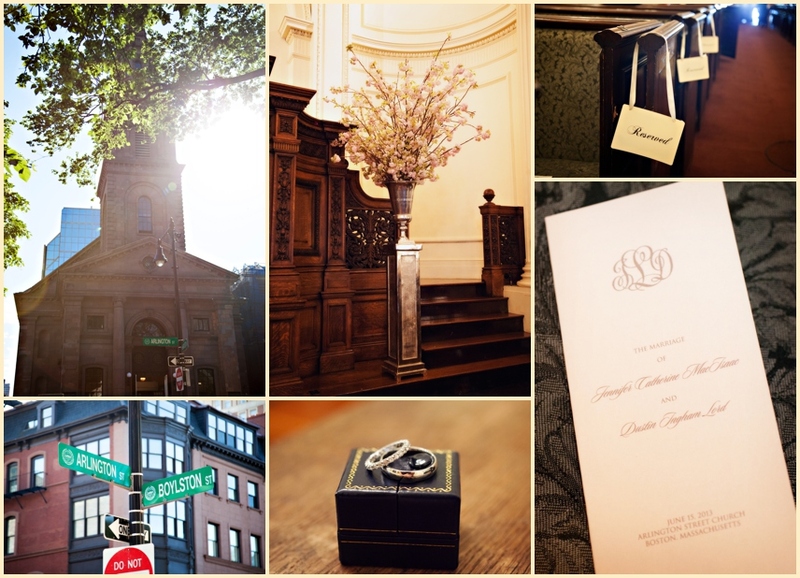 Their location right in the heart of the Back Bay makes it easily accessible to so many great churches, and a quick walk across the street puts you in the Boston Public Garden! 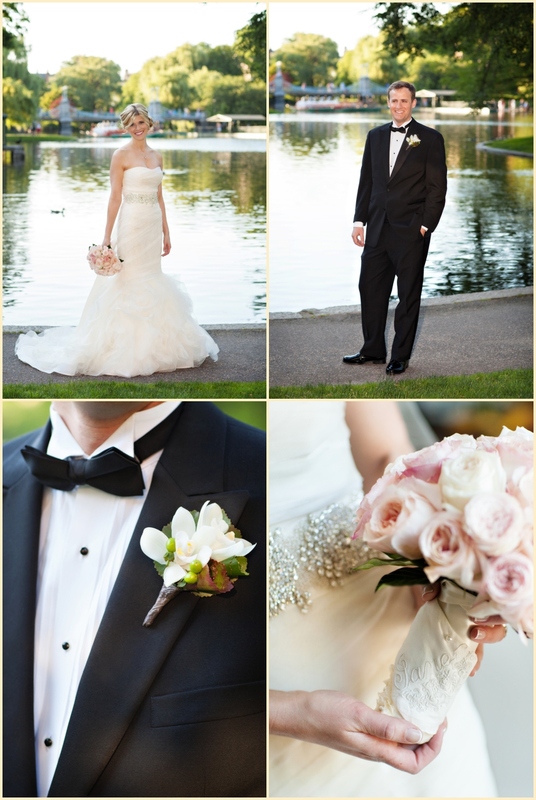 Jennifer and Dustin celebrated on the last weekend of Spring and we had a wonderful time capturing the day. 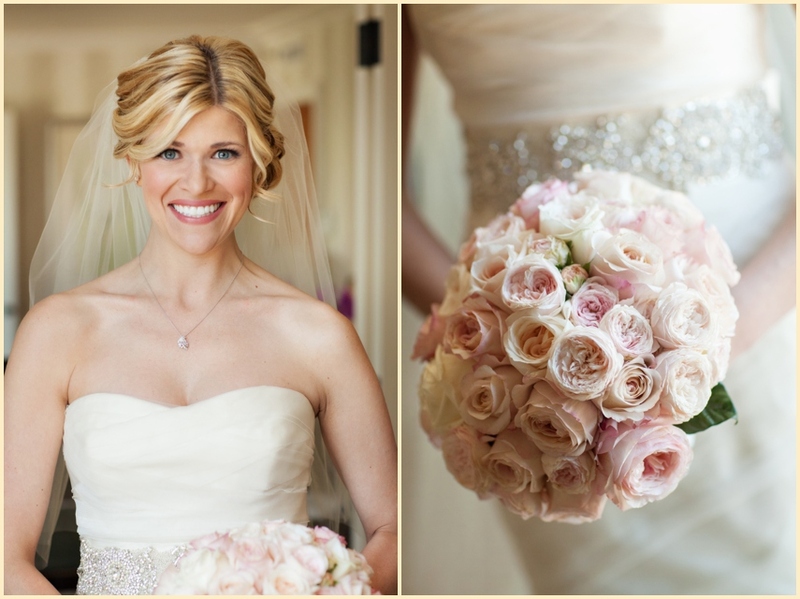 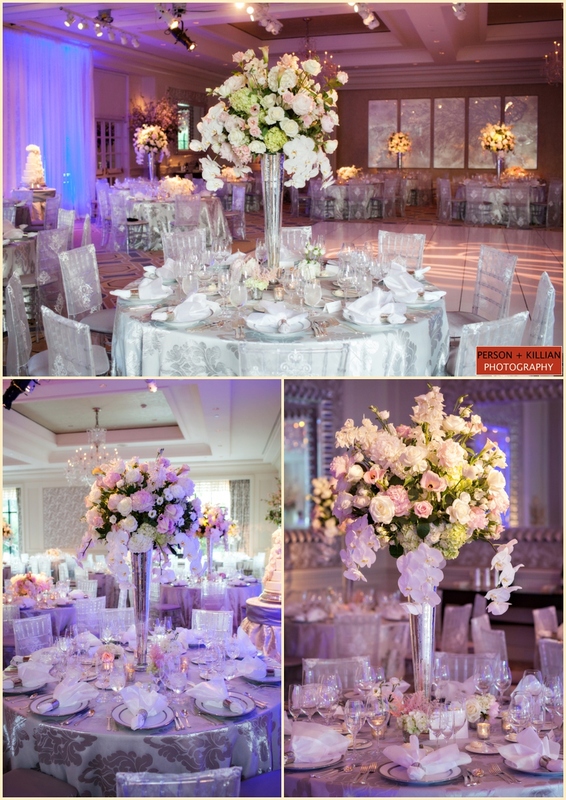 The color palette of the wedding was classic white, with soft touches of pink accented throughout. 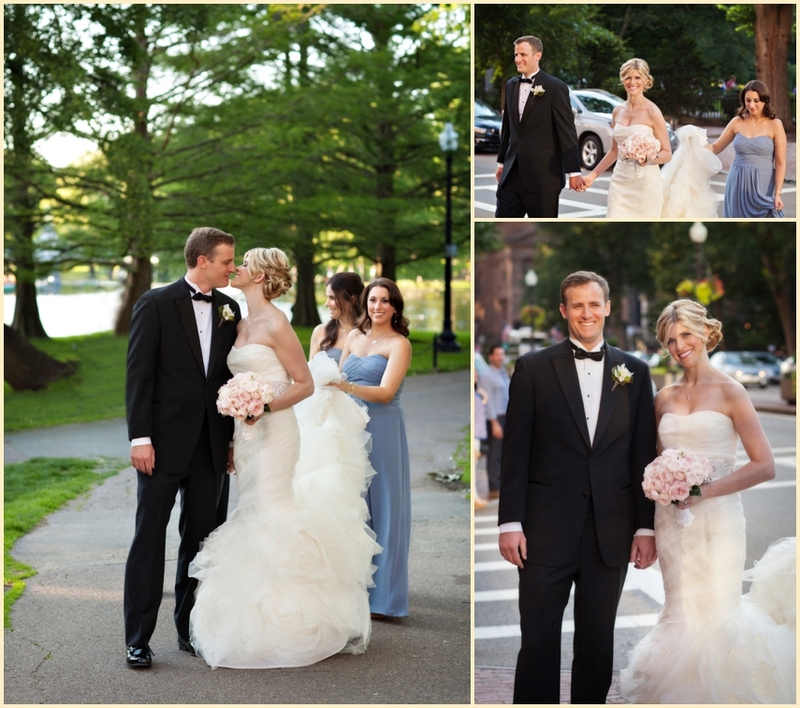 Jennifer looked stunning in a strapless mermaid gown, with silver beading at the waist. 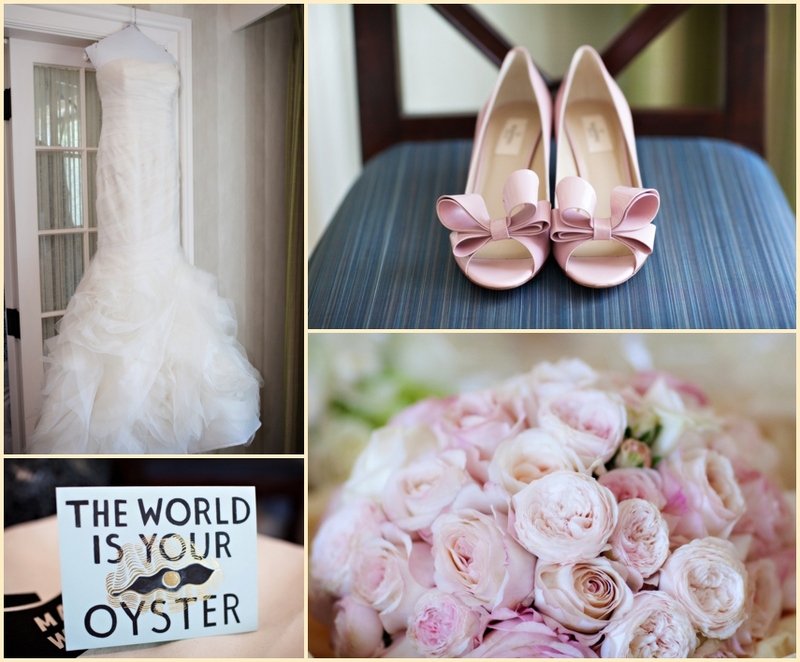 Her bouquet was pink peonies and roses, and we loved her pink Valentino heels to match! 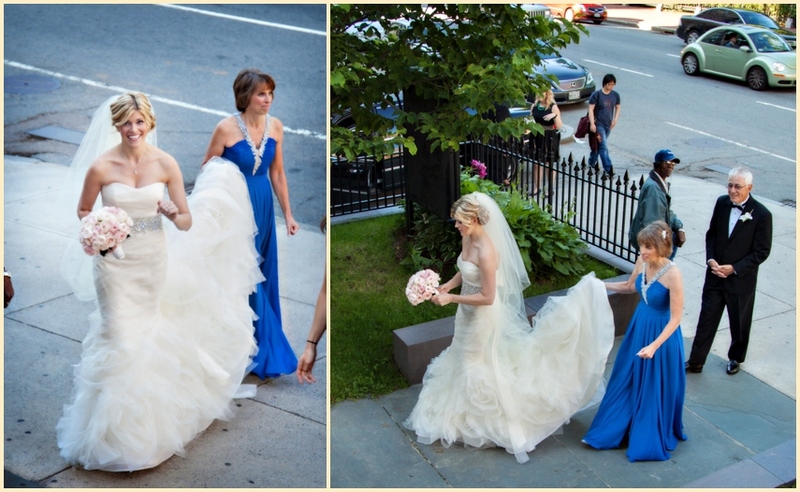 The bridesmaids wore strapless blue dresses, with white and green floral bouquets. 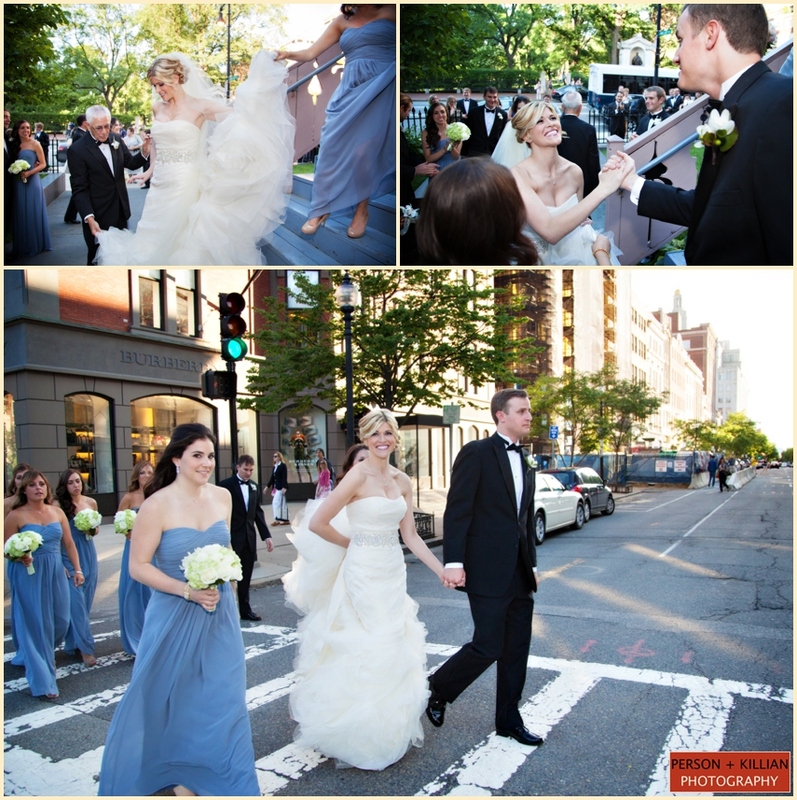 Jennifer wanted to incorporate her love of bows and gave each of the bridesmaids a Tiffany & Co Silver Bow Ribbon necklace. 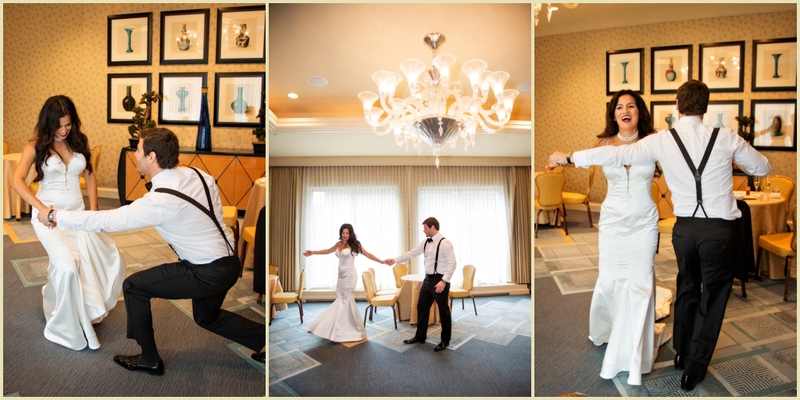 As Dustin was opening his gift from Jen (an antique clock similar to the one her parents received on their wedding day), Jen received a gorgeous pair of Tiffany Pearl earrings from the Groom. 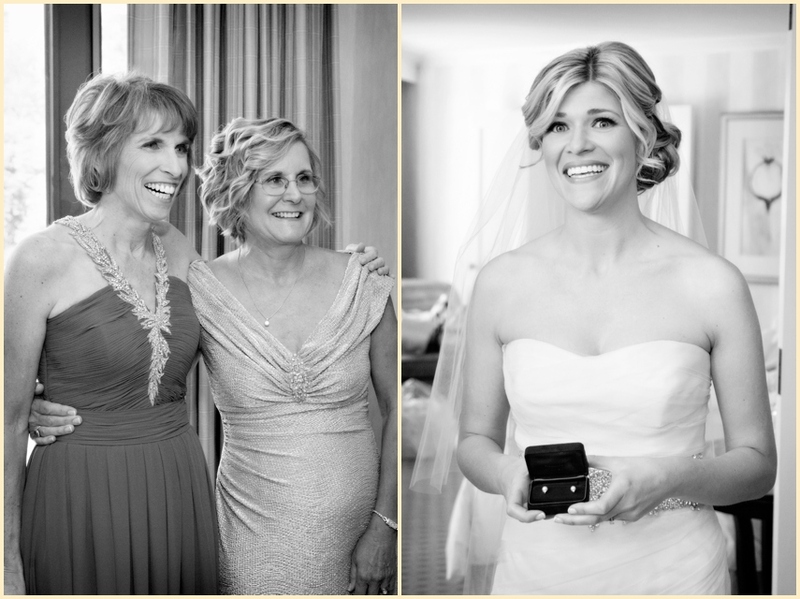 As a surprise for her wedding shower, Jen received a necklace made from one of her grandmothers old rings from her mom and dad that completed her look. 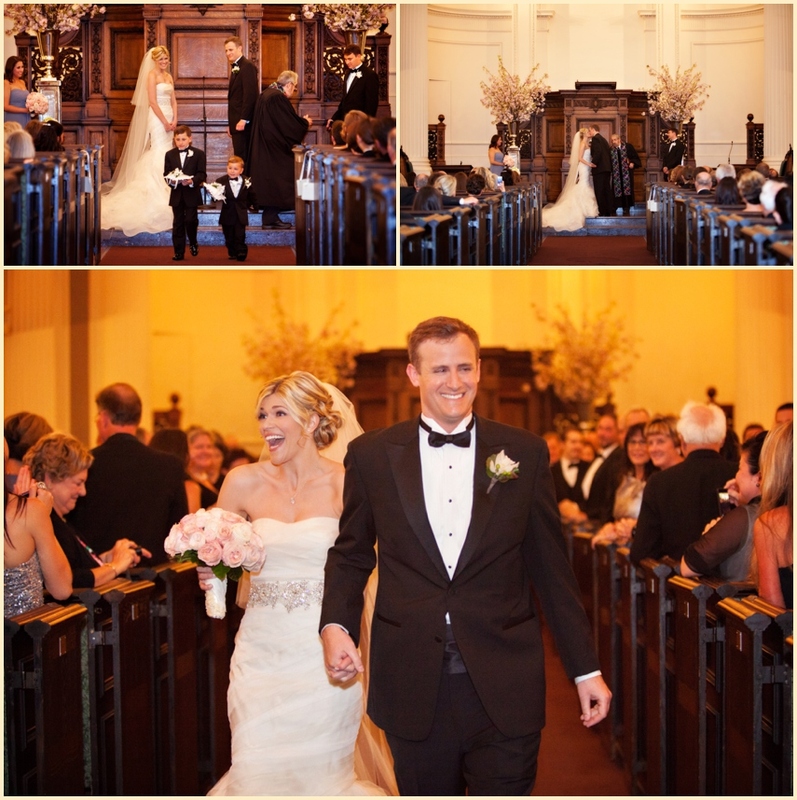 The ceremony took place at the nearby Arlington Street Church. 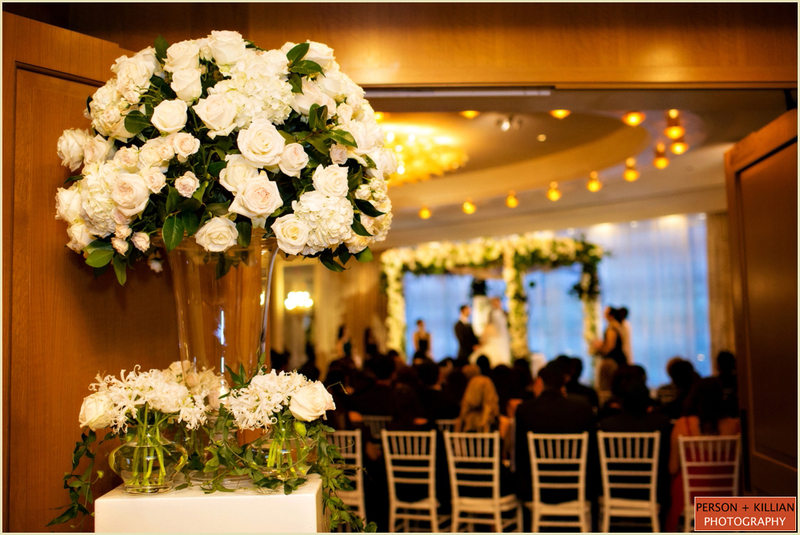 Columbine Floral Design created two beautiful arrangements placed on either side of the church’s altar, matching Jen’s bouquet. 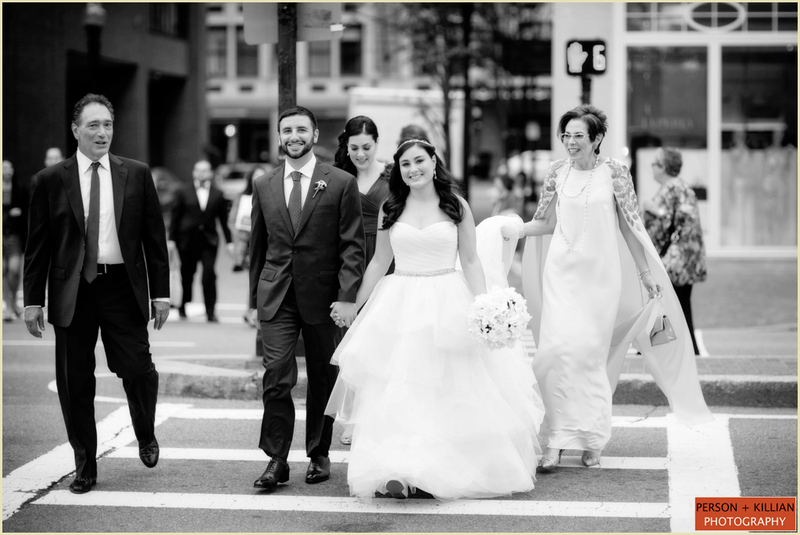 As soon as the ceremony was over, we walked down the street with the happy newlyweds to take pictures in the Boston Public Garden with their bridal party and family. 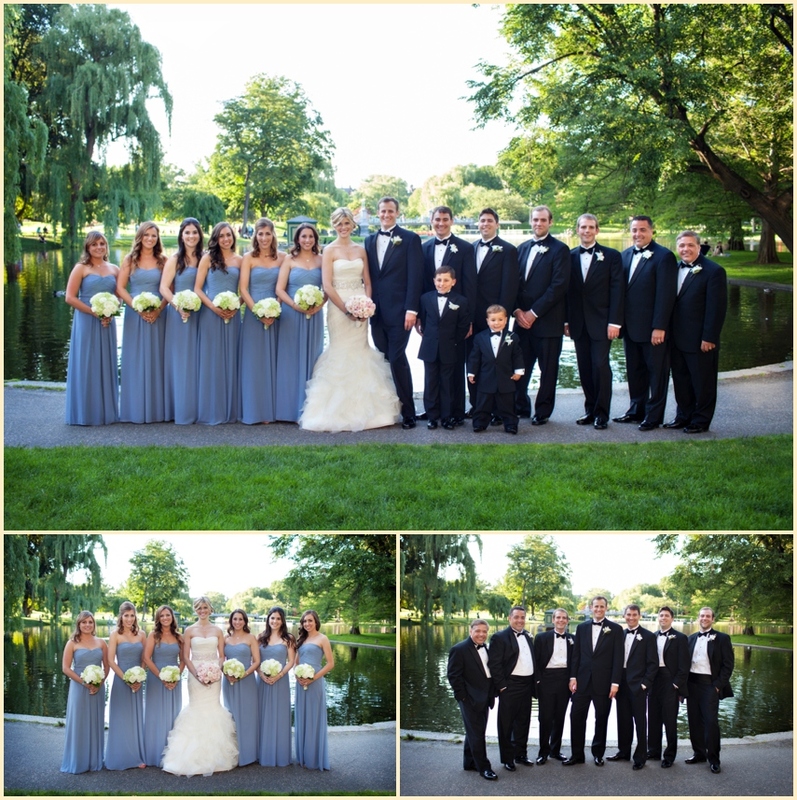 We could not have asked for better weather to capture these outdoor formals with Jennifer, Dustin and their wonderful family before heading back to the Four Seasons Boston for the reception. 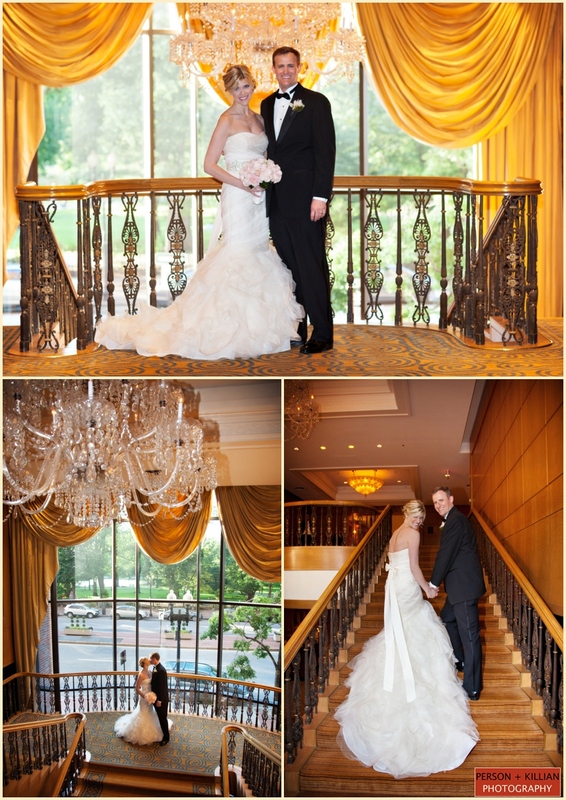 While guests and the bridal party enjoyed cocktails in the Aujourd’hui Room, we had the time to take a few more pictures of Jennifer and Dustin on the Four Season’s elegant grand staircase. 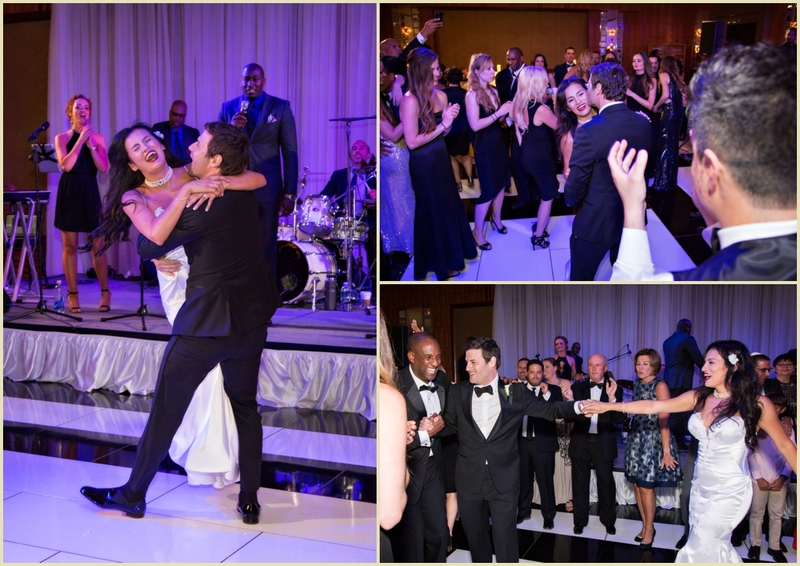 We LOVED Jen’s reaction when the Hopple Popple and Four Seasons team gave the couple a sneak peak at the ballroom (newly renovated)! 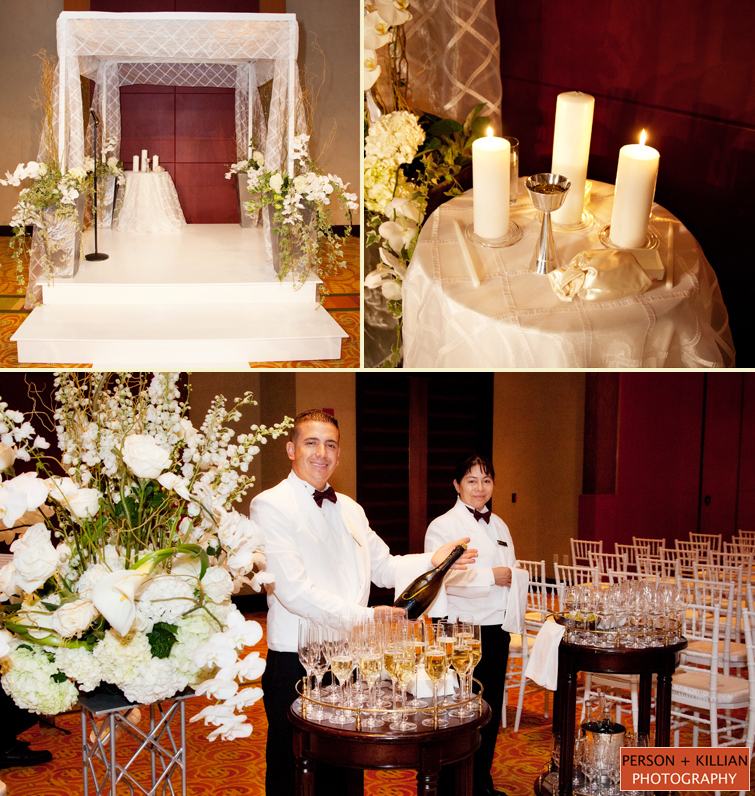 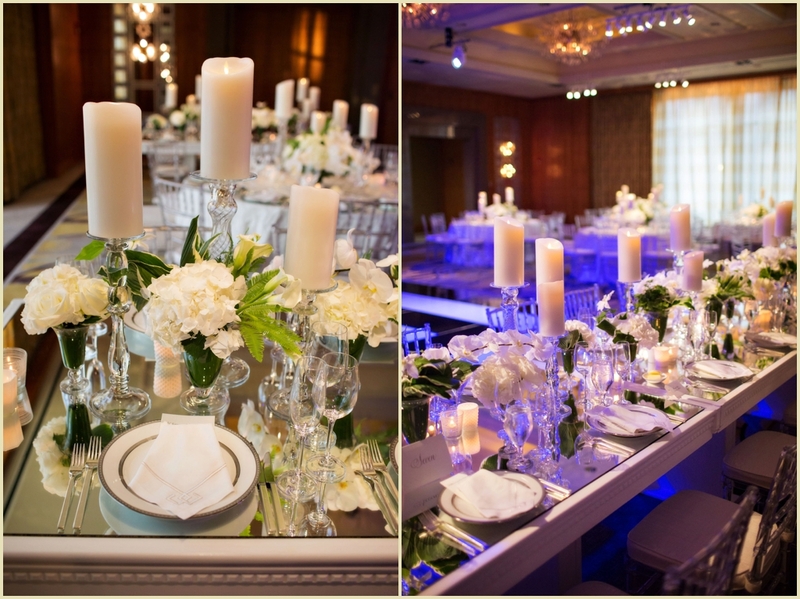 Silver linens topped the tables, with softly veiled silver ballroom chairs around each. 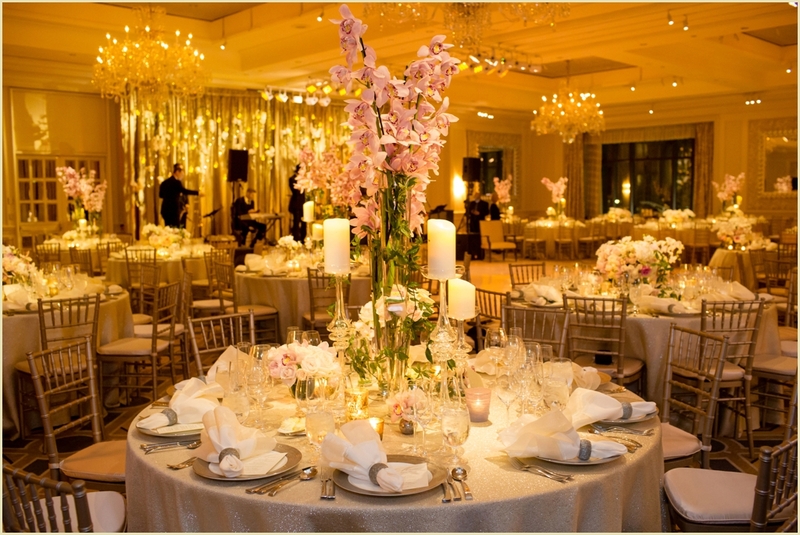 The beautiful floral centerpieces were filled with white roses, pink peonies, and hanging white orchids. 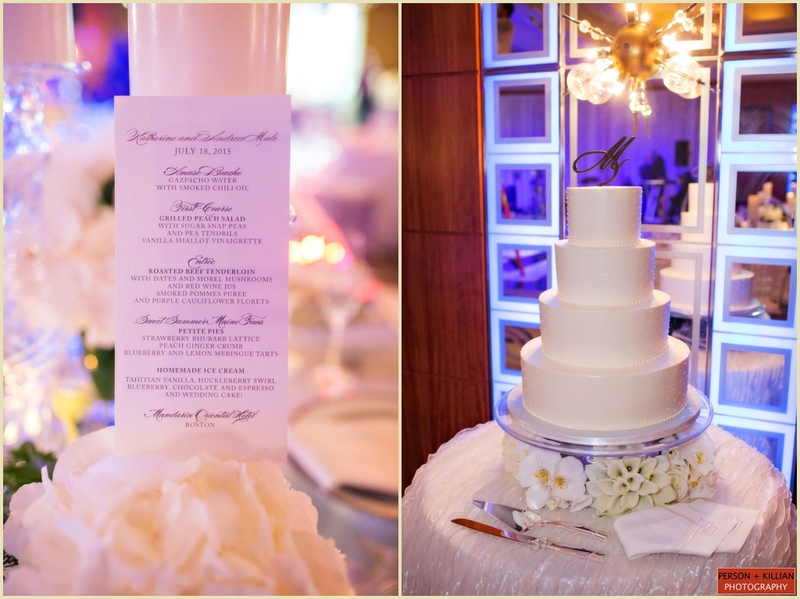 The 5-tiered white wedding cake was decorated with cascading white flowers, and displayed Jennifer + Dustin’s custom monogram. 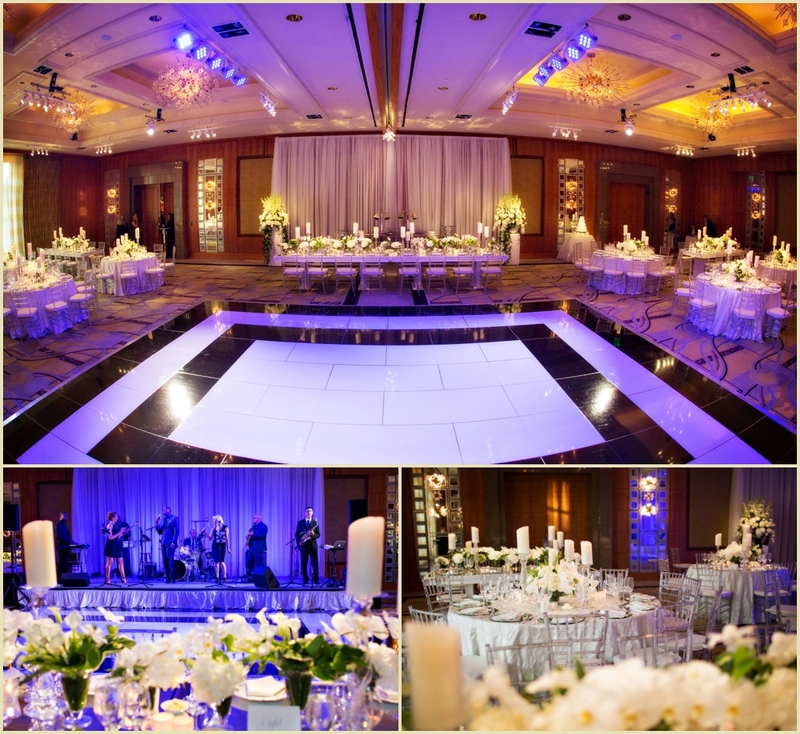 The same monogram was projected with light onto the white dance floor, adding a personal touch to this classically elegant wedding reception. 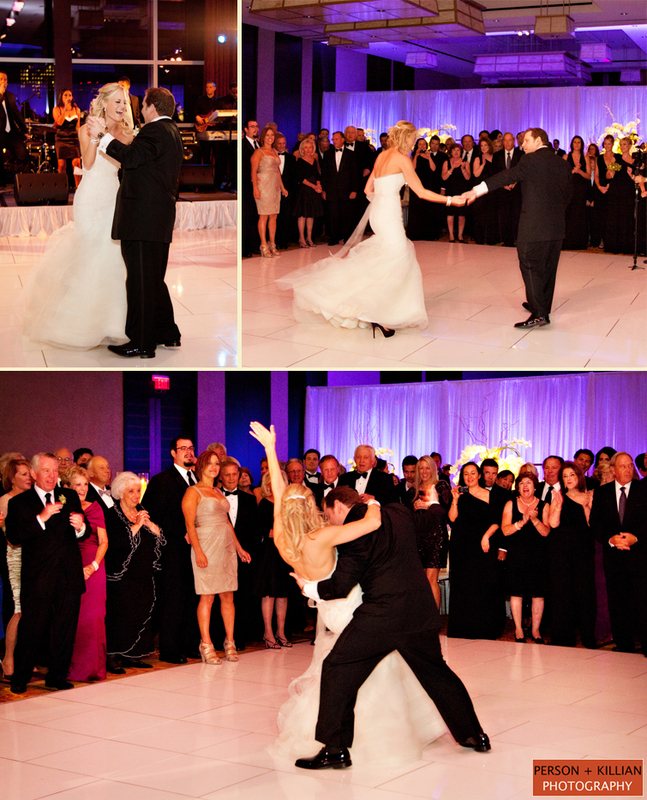 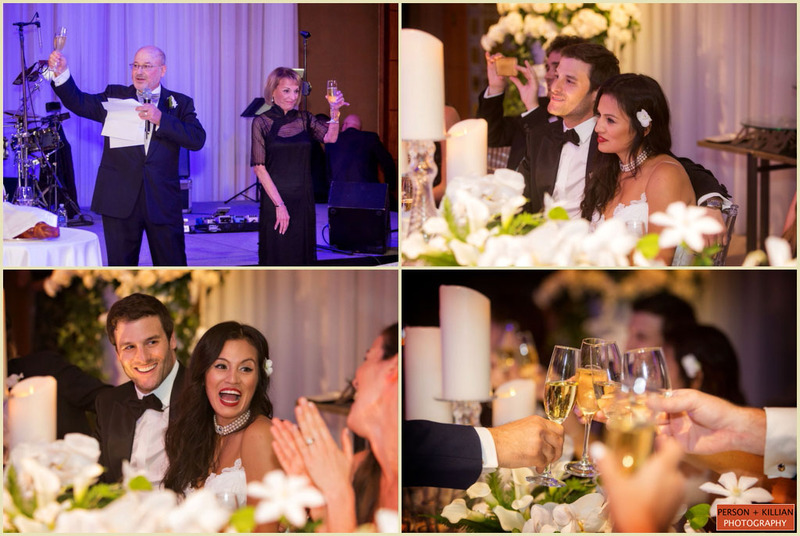 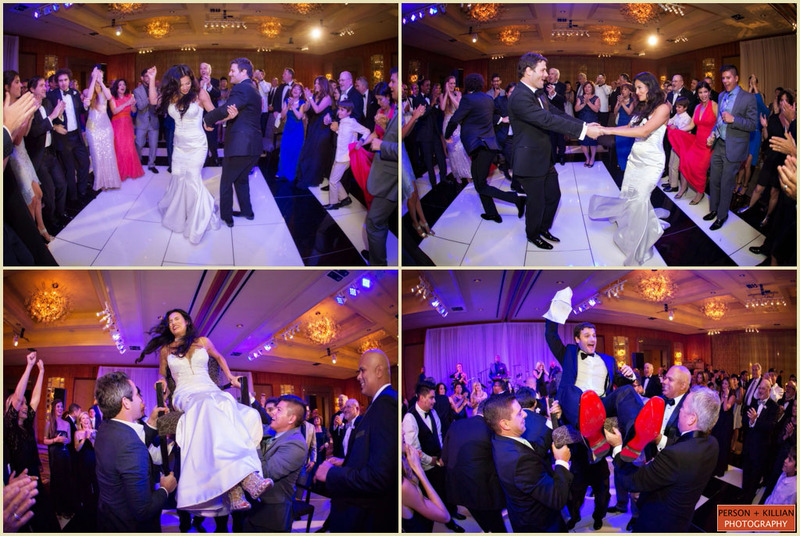 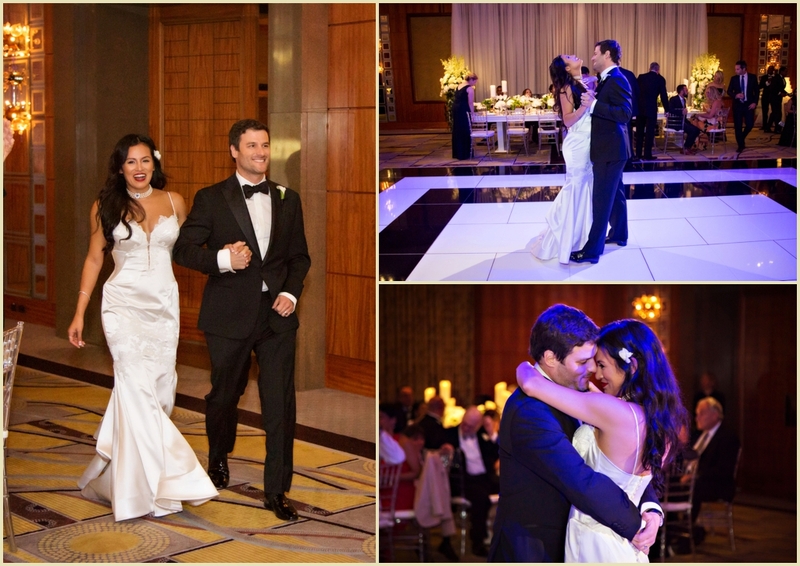 Guests were ready to eat, drink and dance the night away to celebrate this wonderful couple! 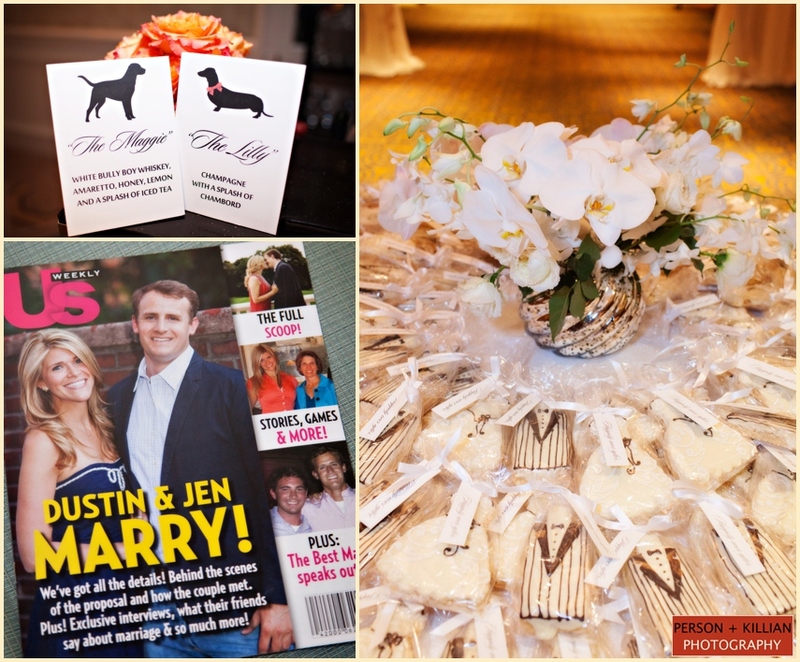 Bartenders served two signature cocktails named after the couple’s dogs — “The Maggie” and “The Lilly”. 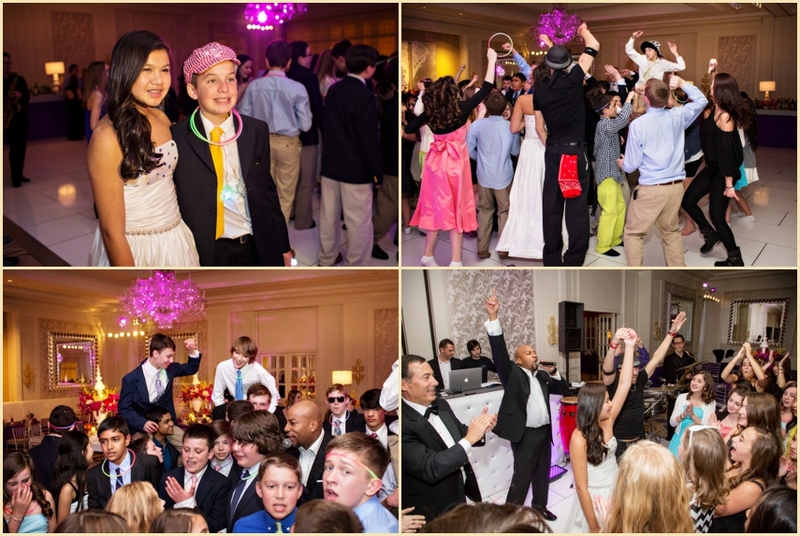 After speeches, formal dances, and the cutting of the cake, the dance floor was opened for the rest of the evening. 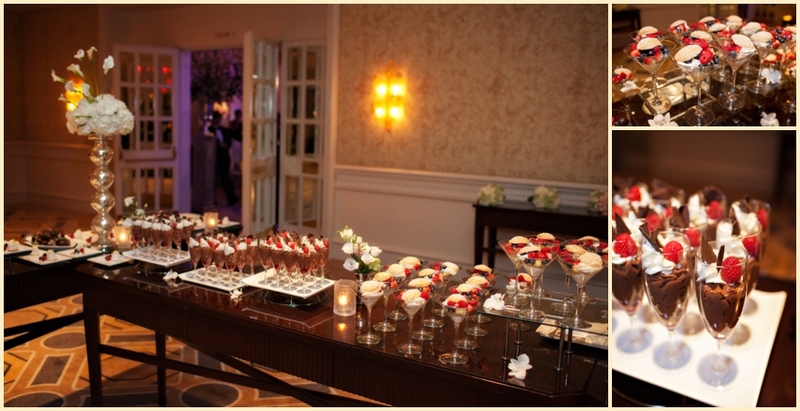 As well as a traditional dessert station at the end of the night, guests enjoyed individually wrapped Bride and Groom cookies to take home with them. 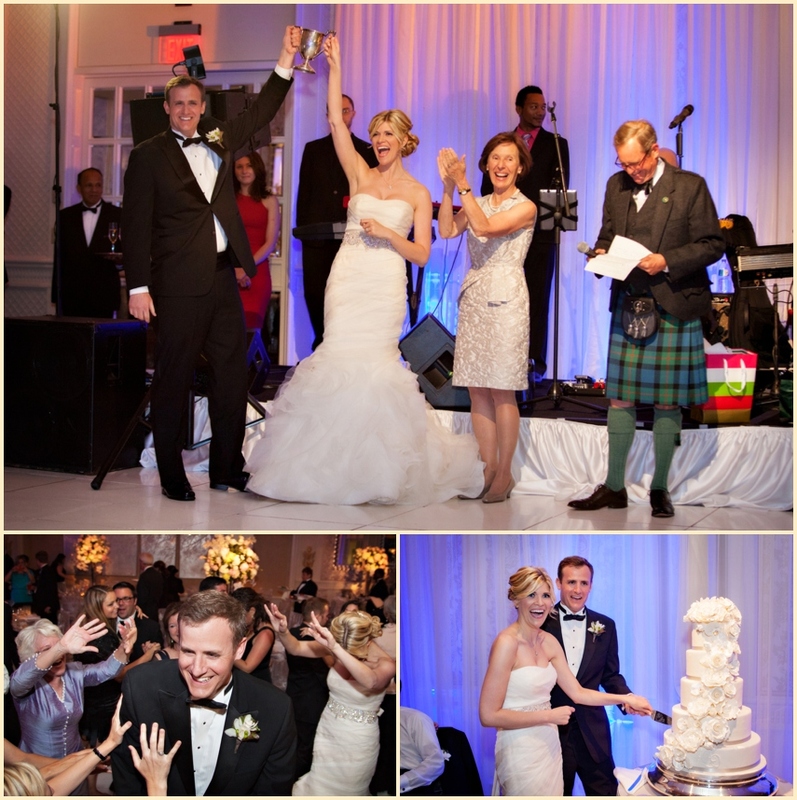 We had such a blast celebrating this day with Jennifer + Dustin. 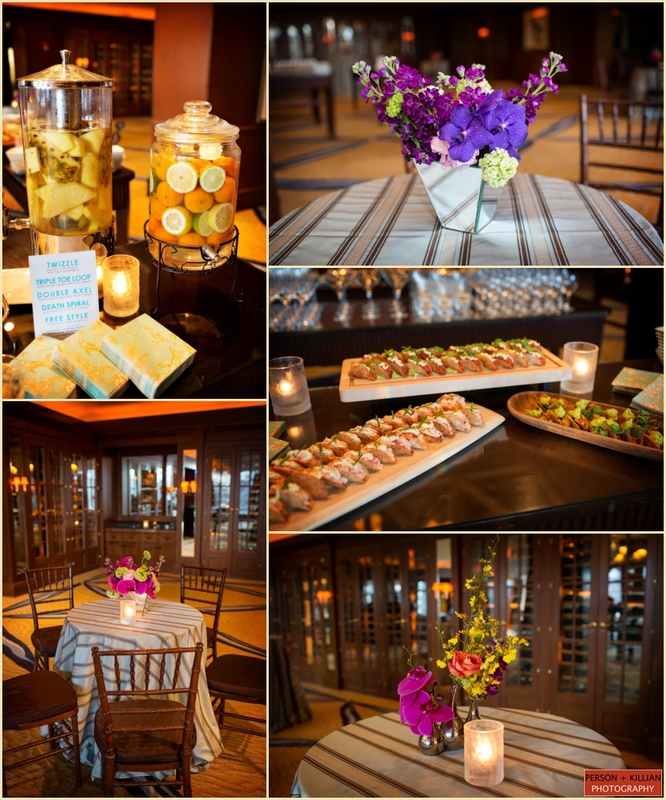 Special thanks to ladies of Hopple Popple for such a beautiful event as always, and the entire team at the Four Seasons Boston. 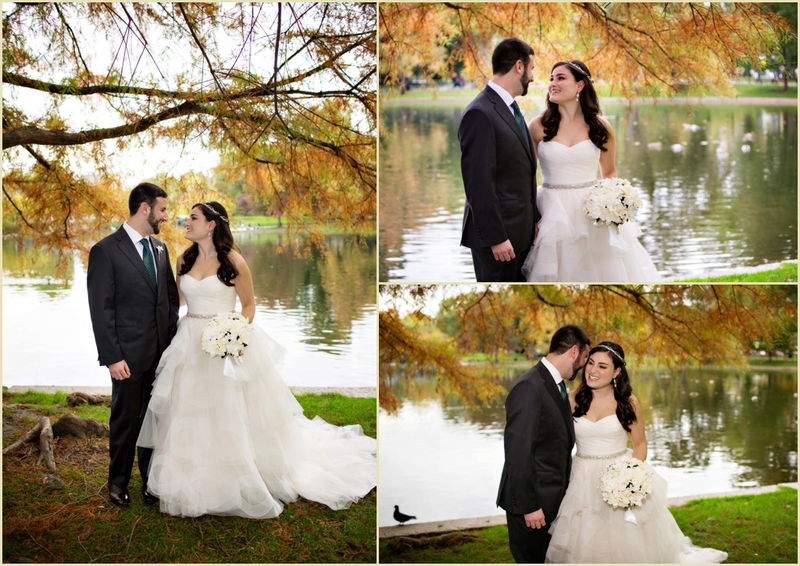 Congratulations Jennifer + Dustin! 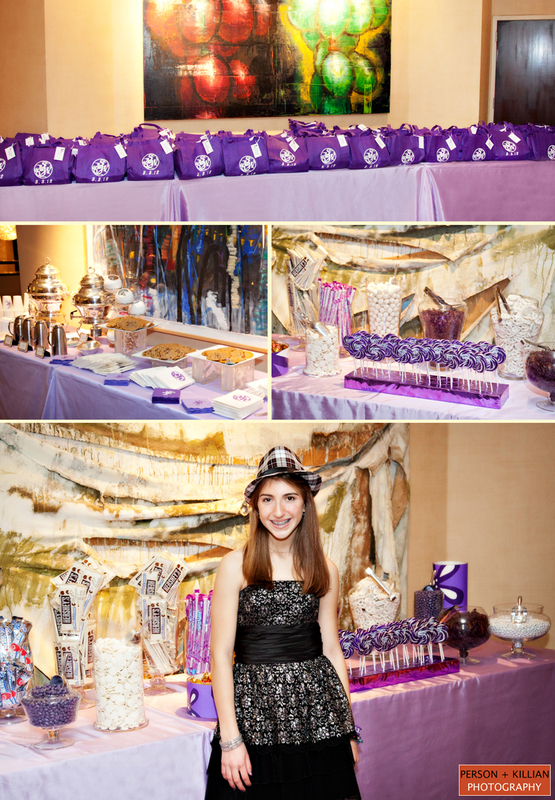 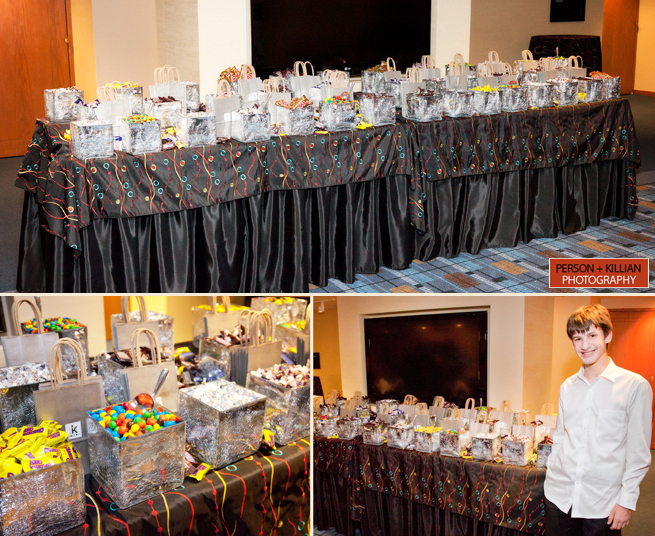 This March we had the pleasure of photographing a Royal Sonesta Bat Mitzvah. 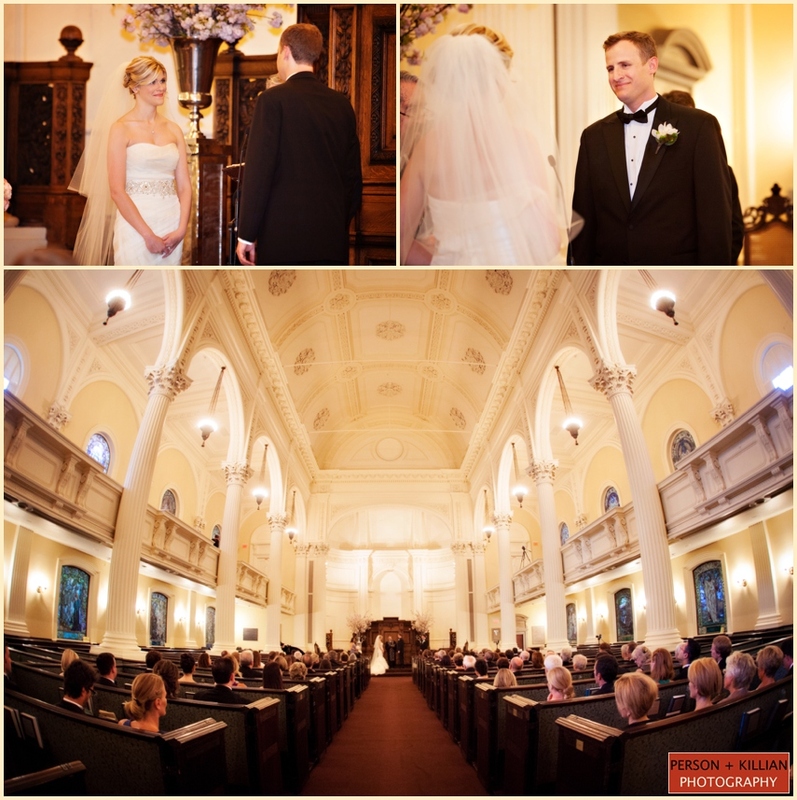 We started at Temple Emmanuel in Newton, MA with Ally and her wonderful family for a mix of fun, candid and formal photos. 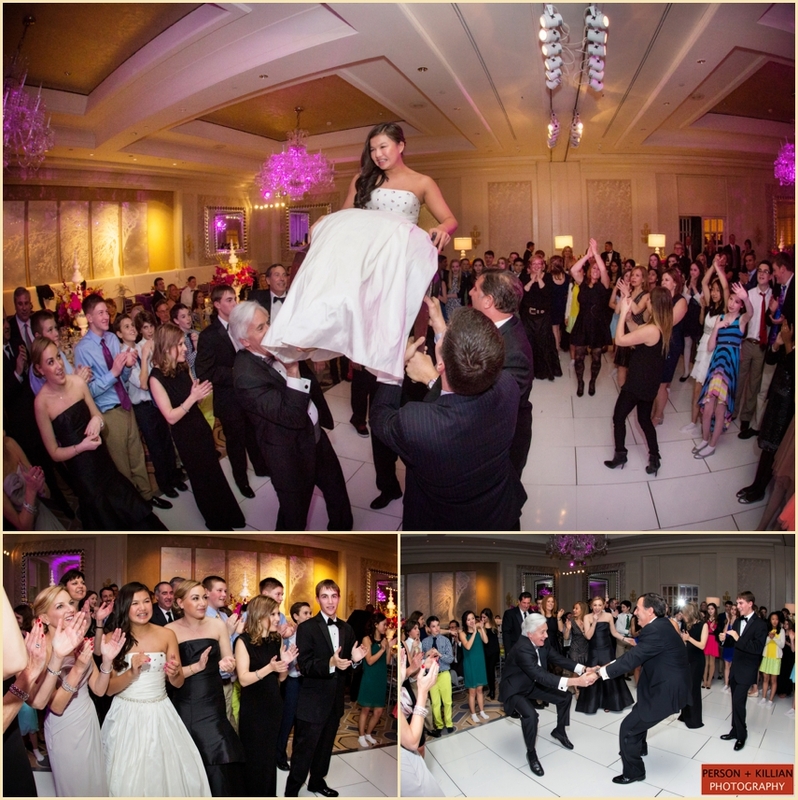 The party kicked off on Saturday night at the Royal Sonesta in Cambridge, MA where Ally’s family and friends came to congratulate her on a job well done on the morning ceremony. 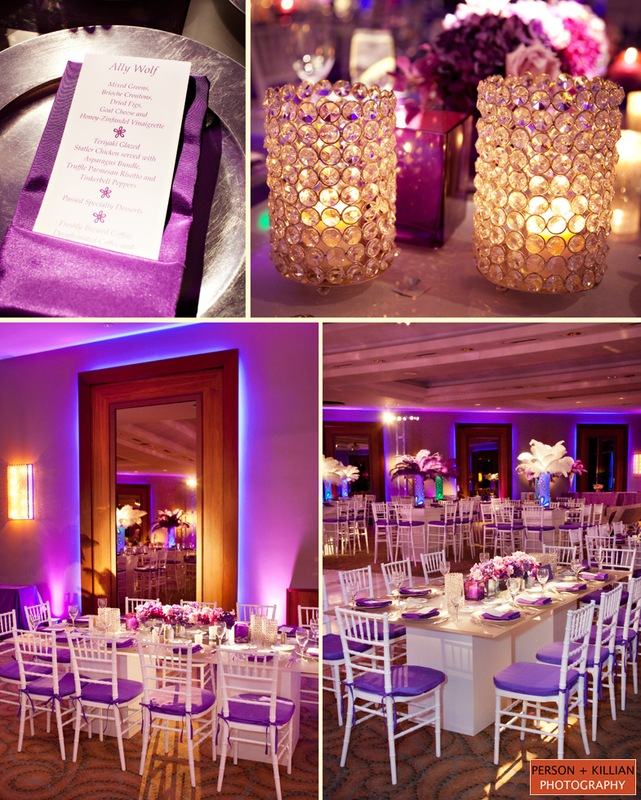 The purple colored theme was custom designed and created by the team at Hopple Popple. 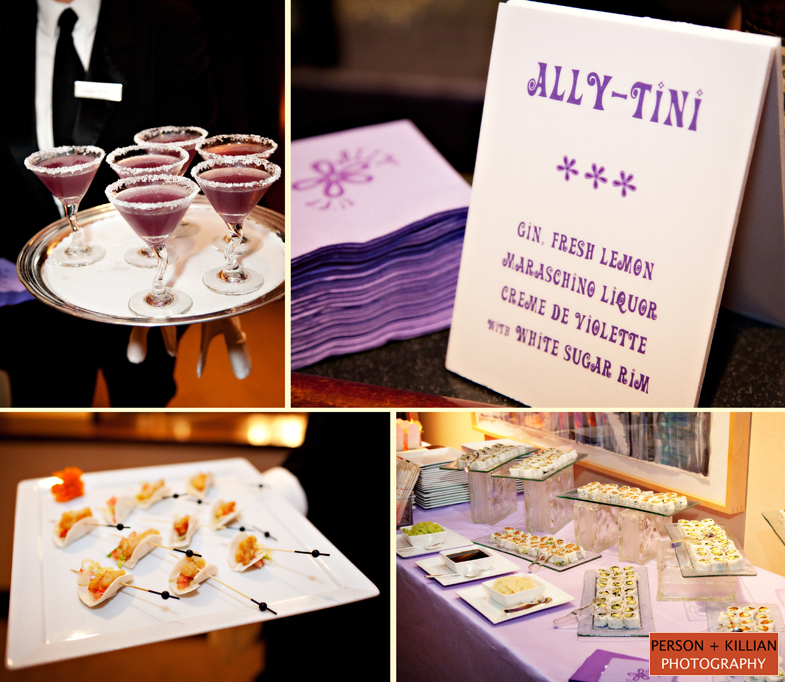 Adults enjoyed cocktail hour that included the signature purple Ally-Tini and the kids spent time at the green screen photobooth. 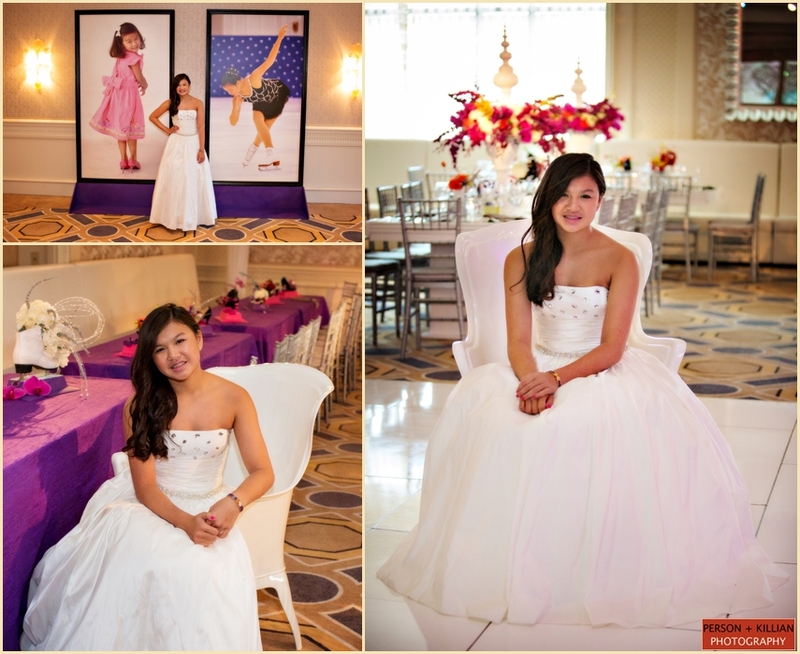 Before guests were invited into the ballroom, we were able to capture some cute photos of Ally and her family in the gorgeous ballroom and take advantage of some of the prop frames from the photobooth. 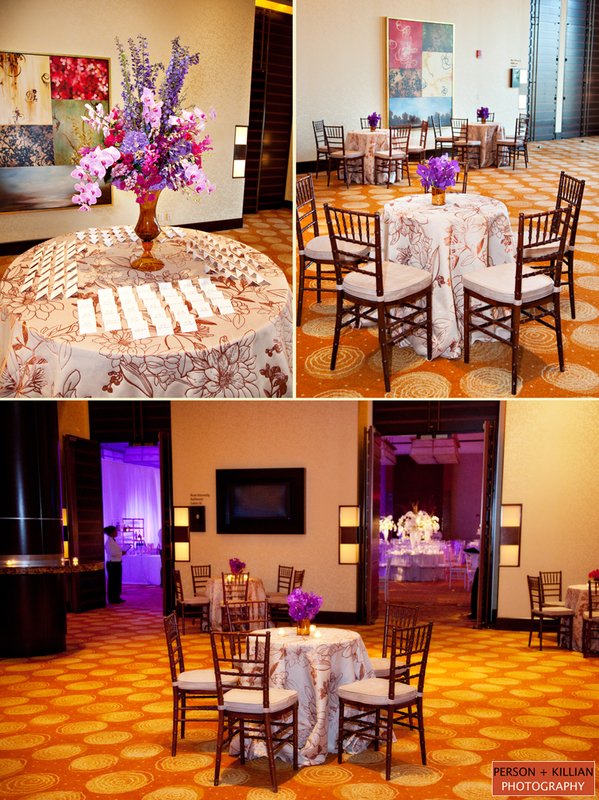 We loved the design and decor in the ballroom which included clear square high-top tables. 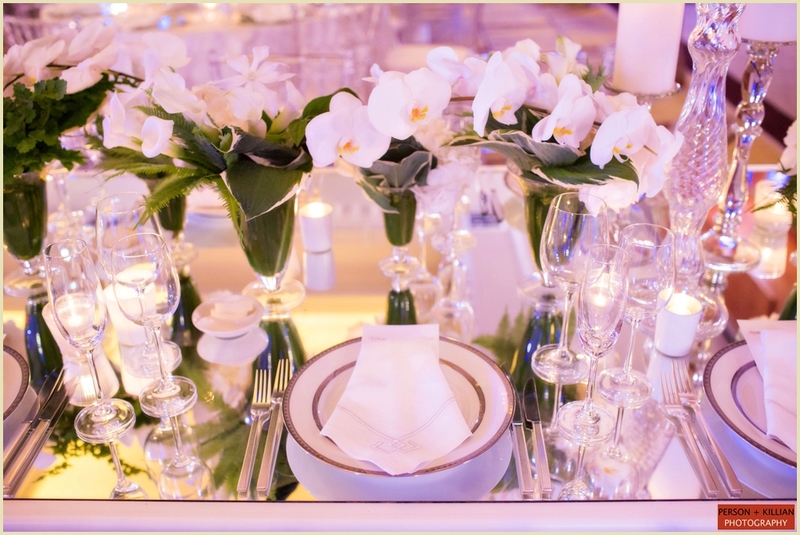 The centerpieces were a show stopper – A mix of white and purple feathers held in custom designed vases with Ally’s flower logo. 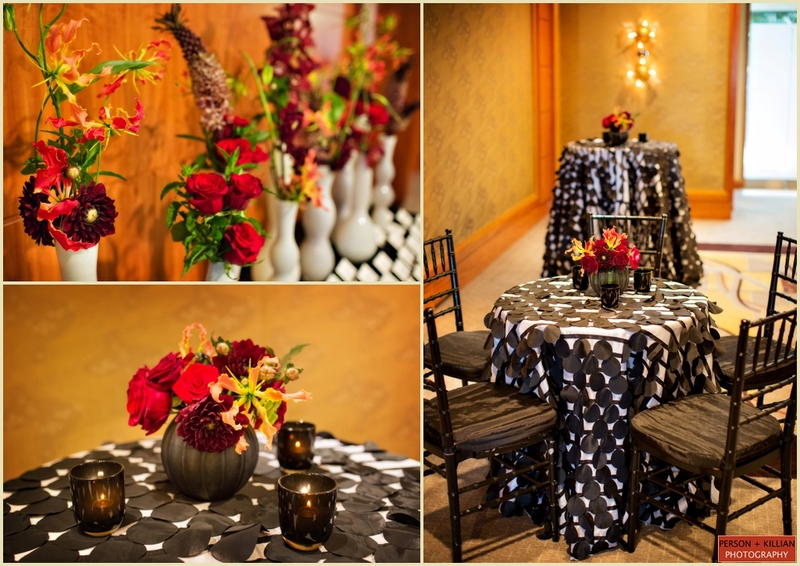 The adult tables had beautiful floral arrangements from the talented team at Spruce Floral. 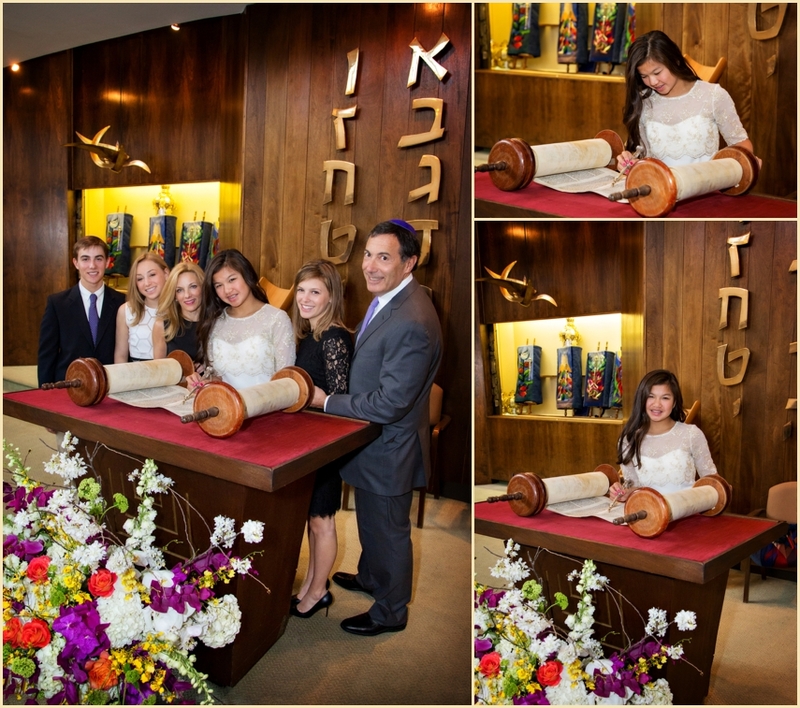 Before the party really kicked into high-gear, we captured some of the important Bat Mitzvah traditions including the Ha-motzi, Horah and candle lighting ceremony. 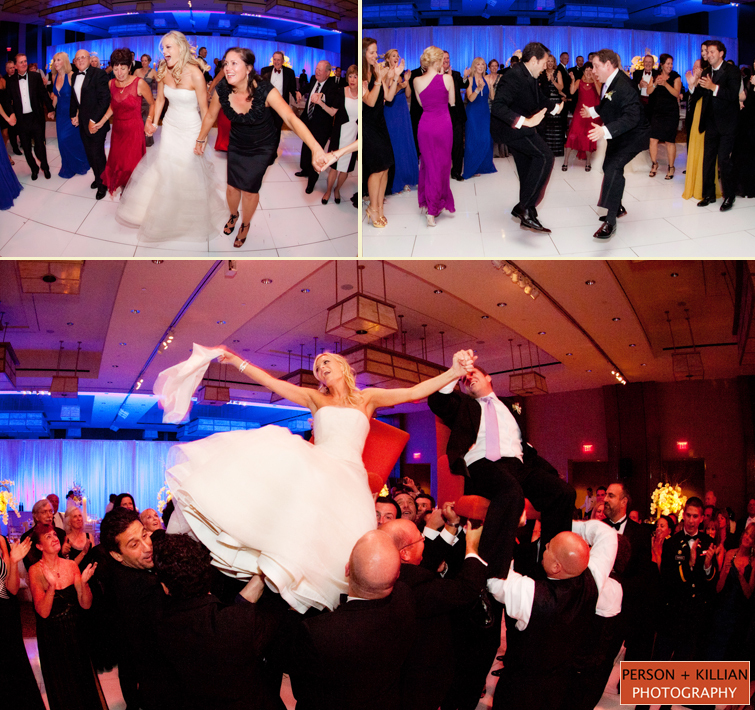 For the rest of the night, guests danced non-stop and were entertained by NYC based Total Entertainment who kept the crowd going and provided us with great photo ops! 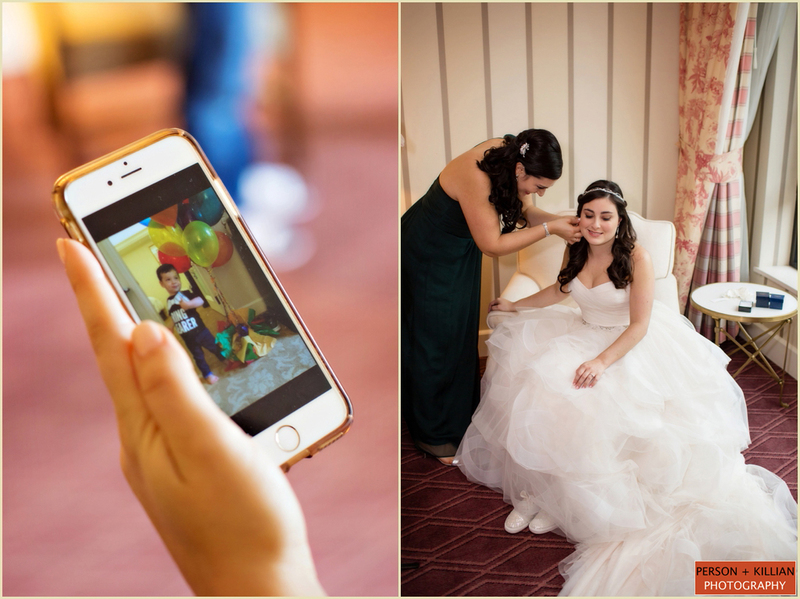 Mazel tov to Ally and her family and thank you for having Person + Killian Photography capture such a special event in your lives. 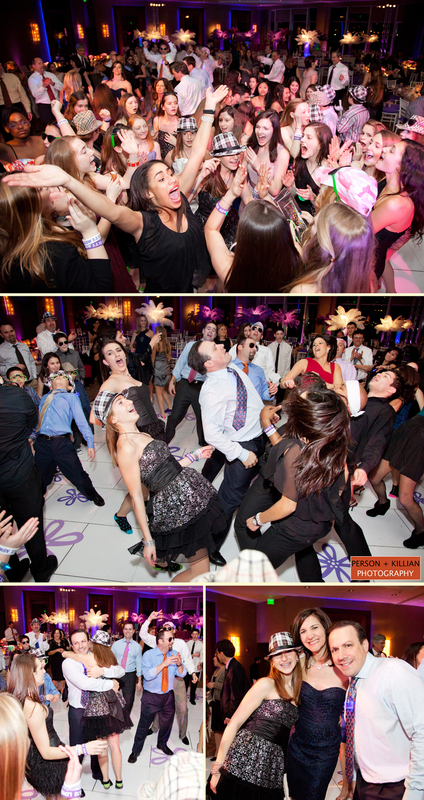 We had a blast capturing such a fun and energetic celebration! 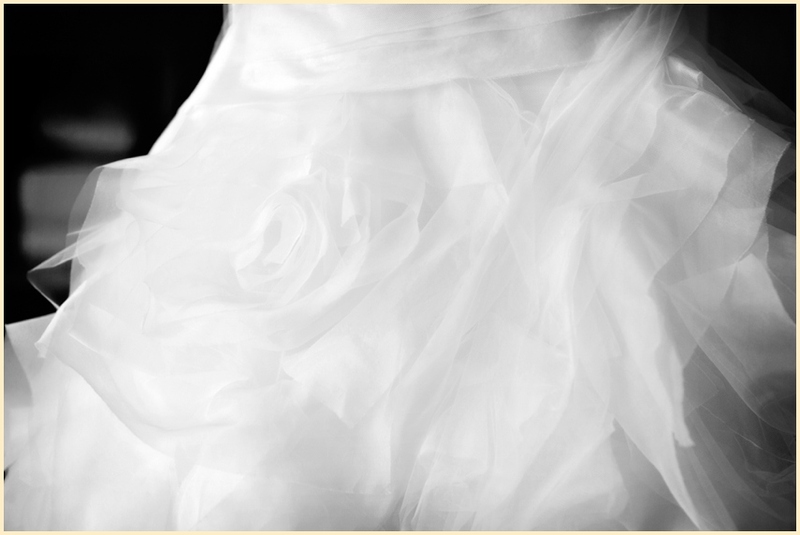 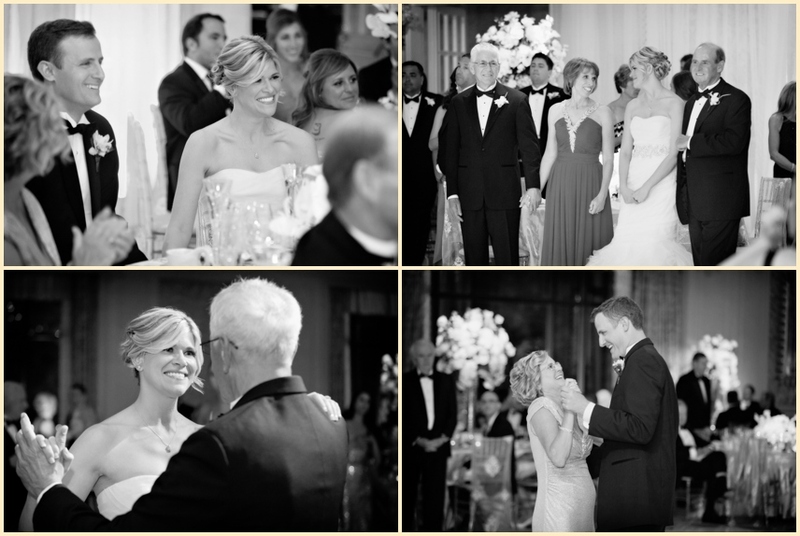 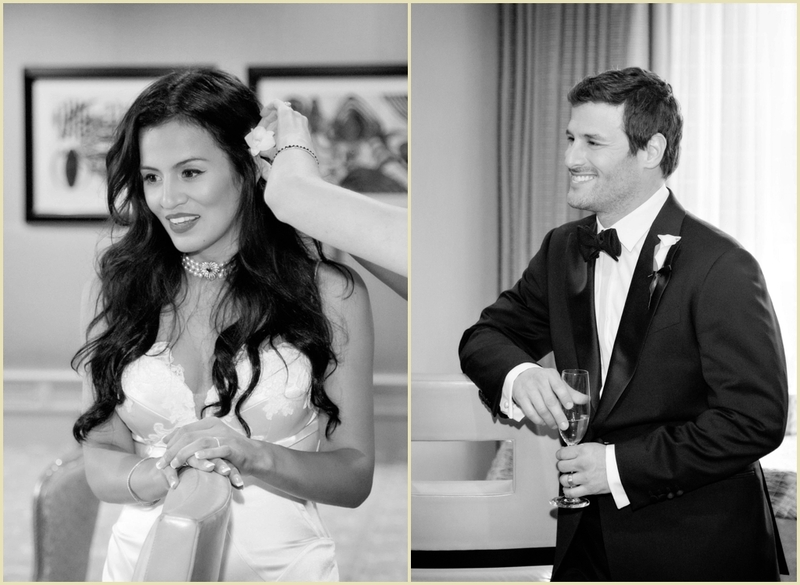 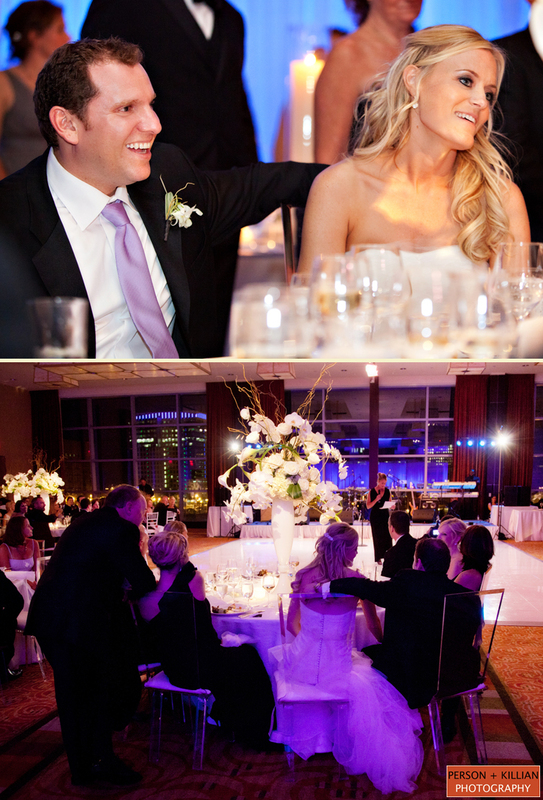 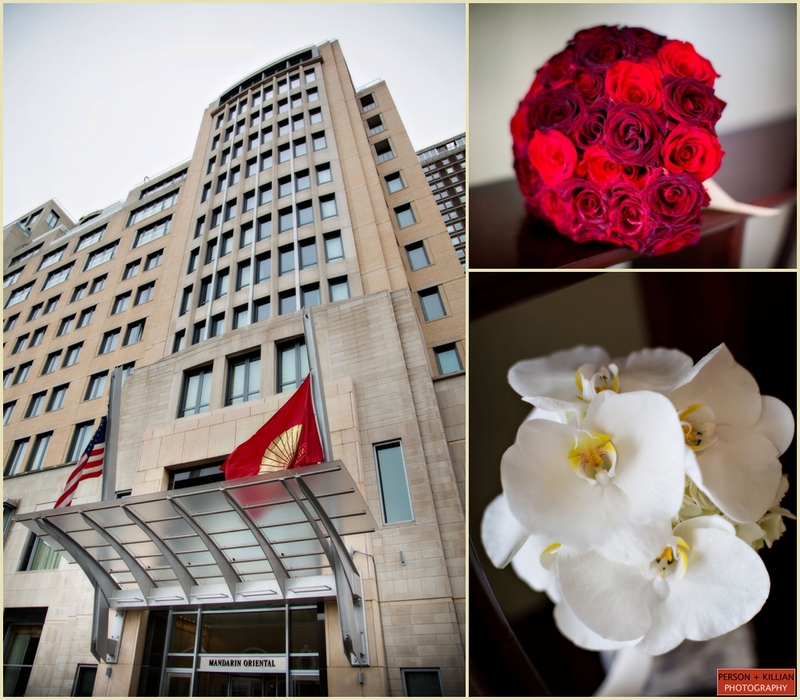 Person + Killian Photography recently photographed the InterContinental Hotel Boston wedding of Kendra and Doug. 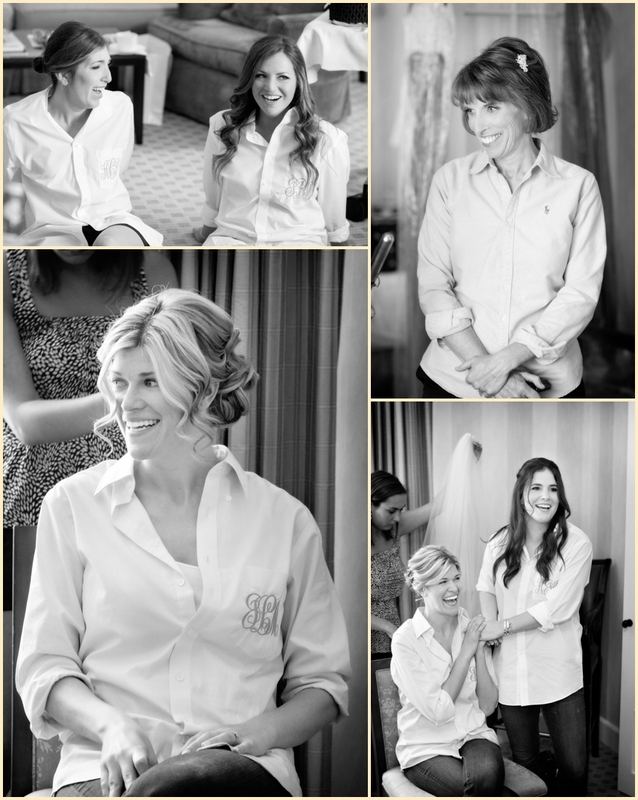 After Kendra and her bridesmaids got ready we headed outside to the waterfront and gardens behind the hotel where Doug saw his bride for the first time. 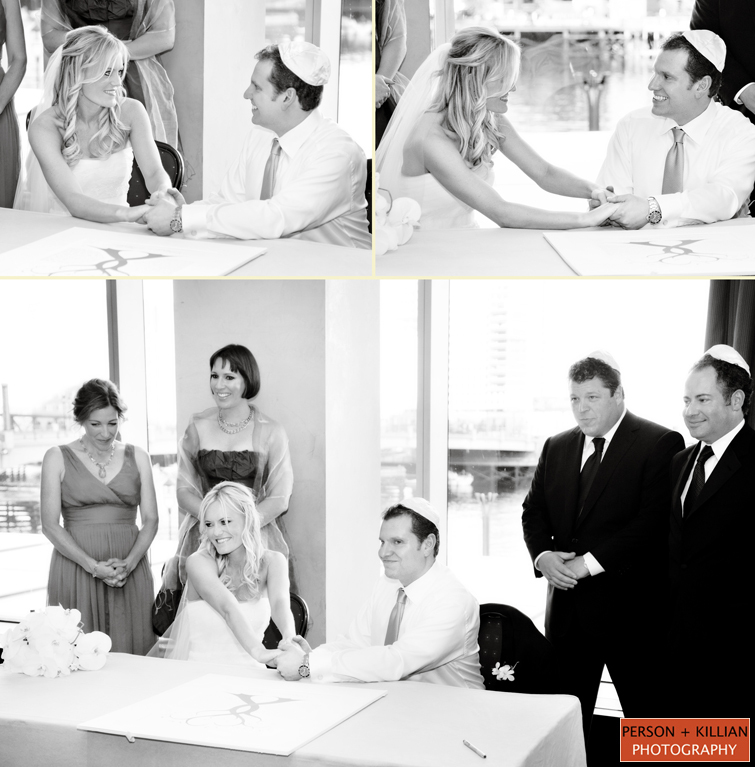 Prior to the ceremony the couple had their traditional Ketubah signing surrounded by their family and a few of their closest friends. 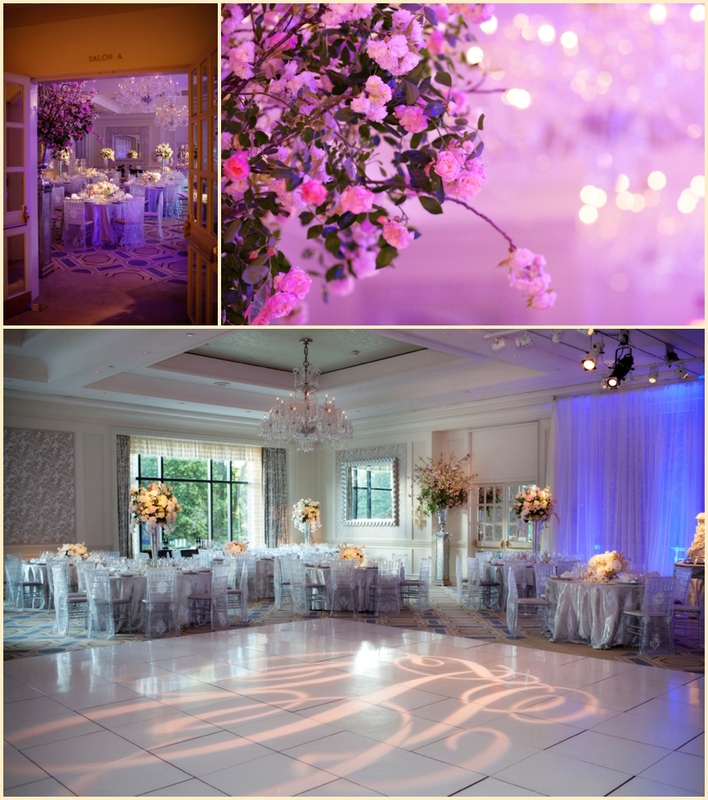 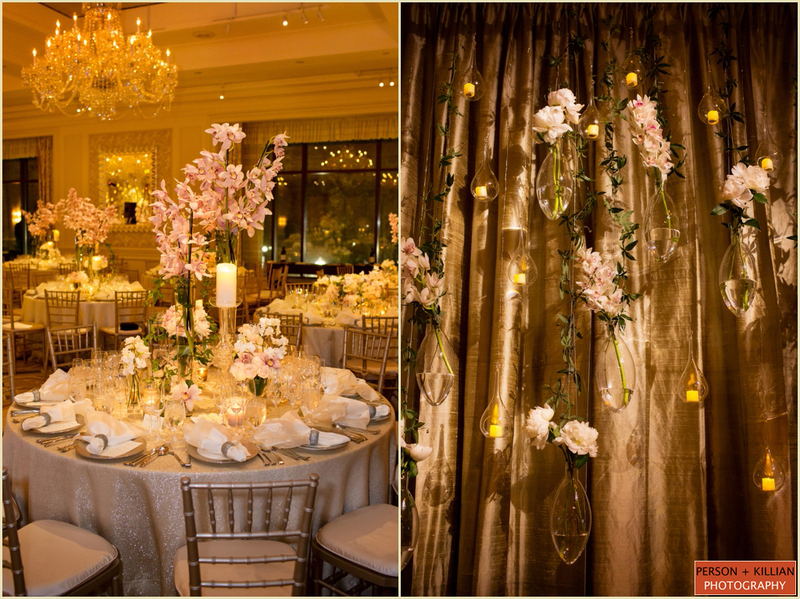 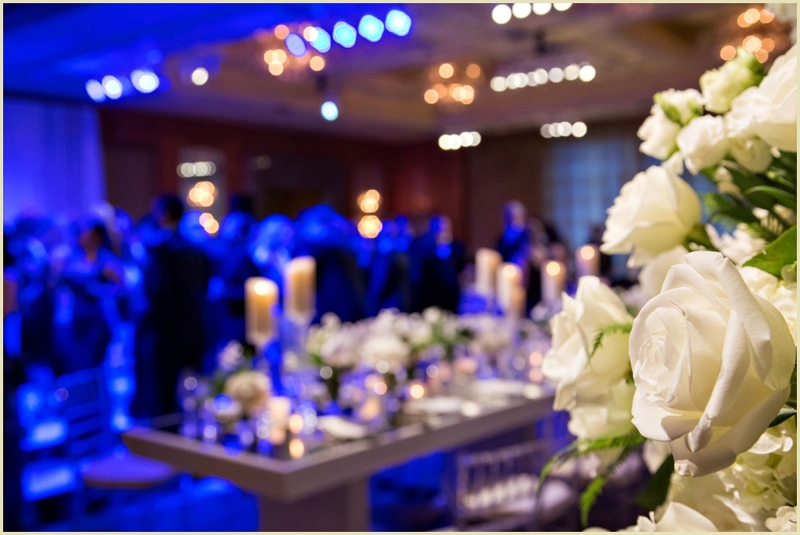 For the reception, the ballroom looked amazing with lush floral designs and beautiful lighting. 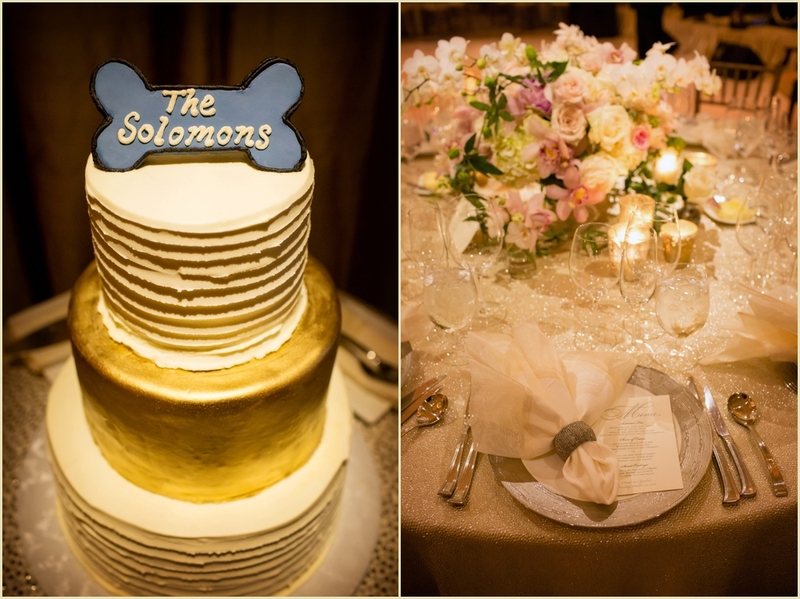 The bride and groom wanted something other than the traditional wedding cake. 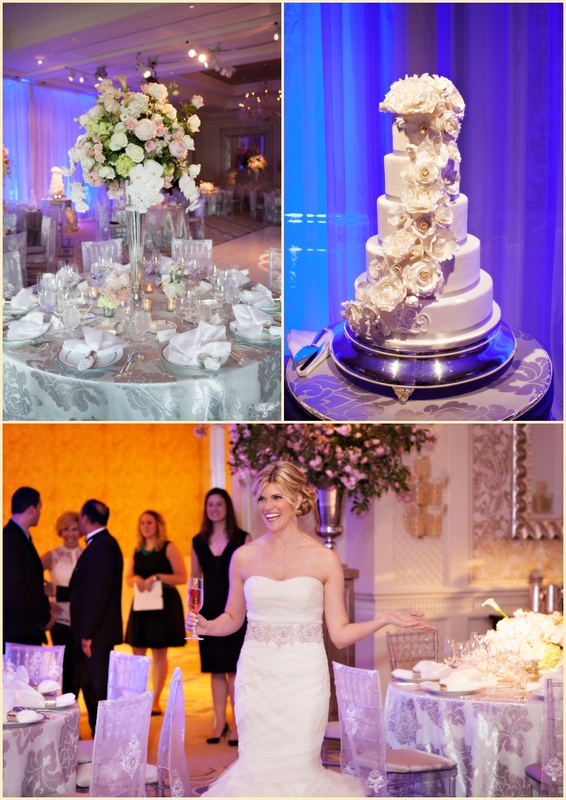 The final result was the top tier of the cake along with cascading deserts that the guests could enjoy. 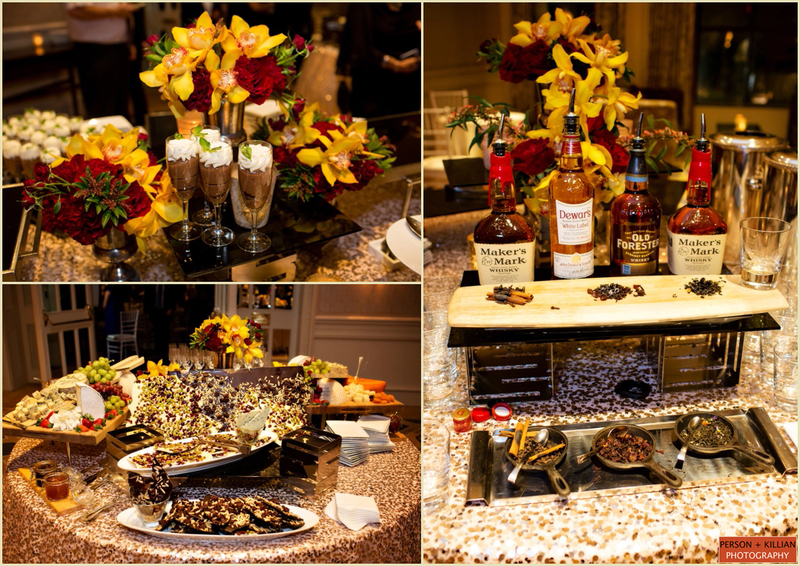 A desert bar was also created by the hotel for guests to enjoy towards the end of the evening. 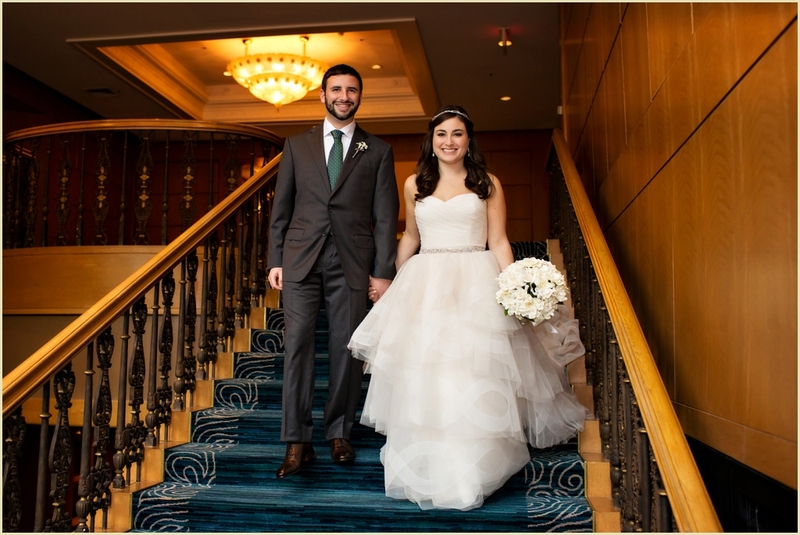 Congratulations Kendra and Doug and thank you for choosing Person + Killian Photography to capture your beautiful wedding day! 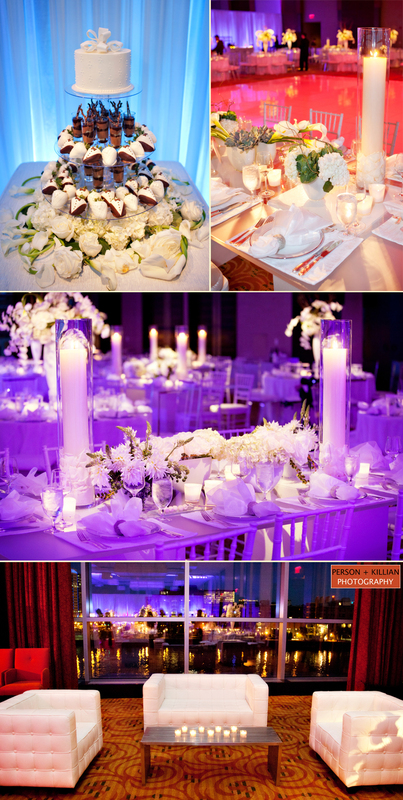 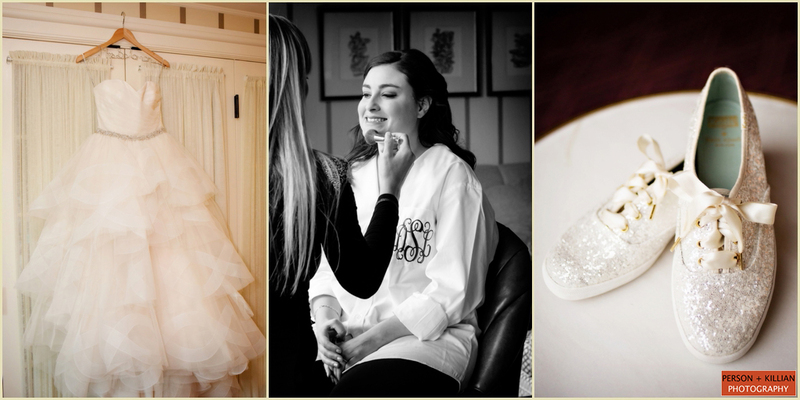 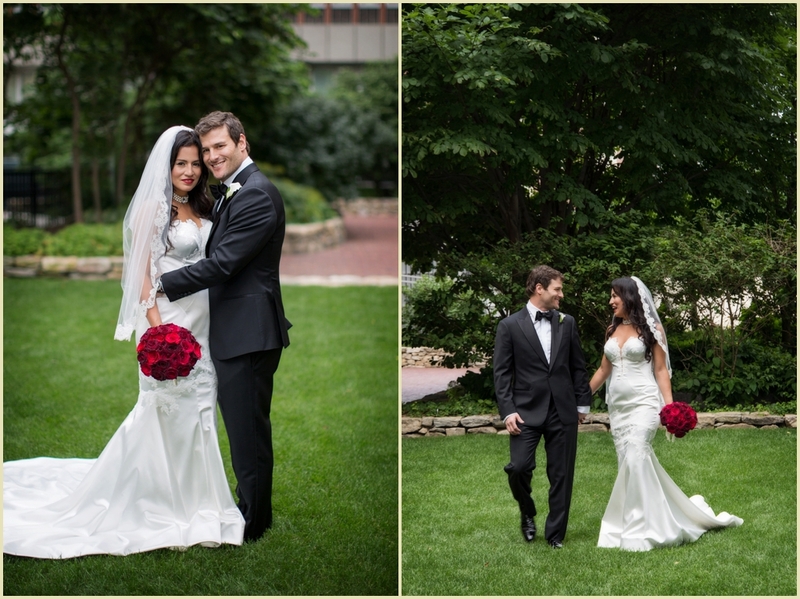 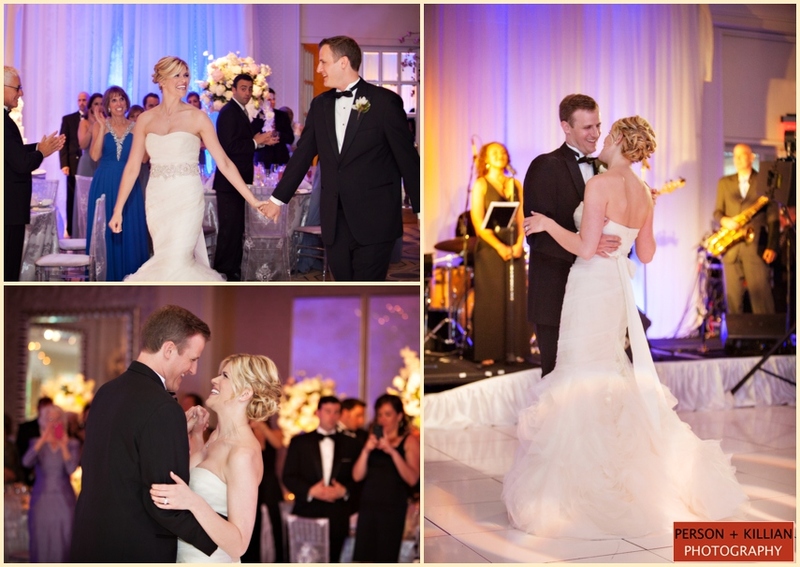 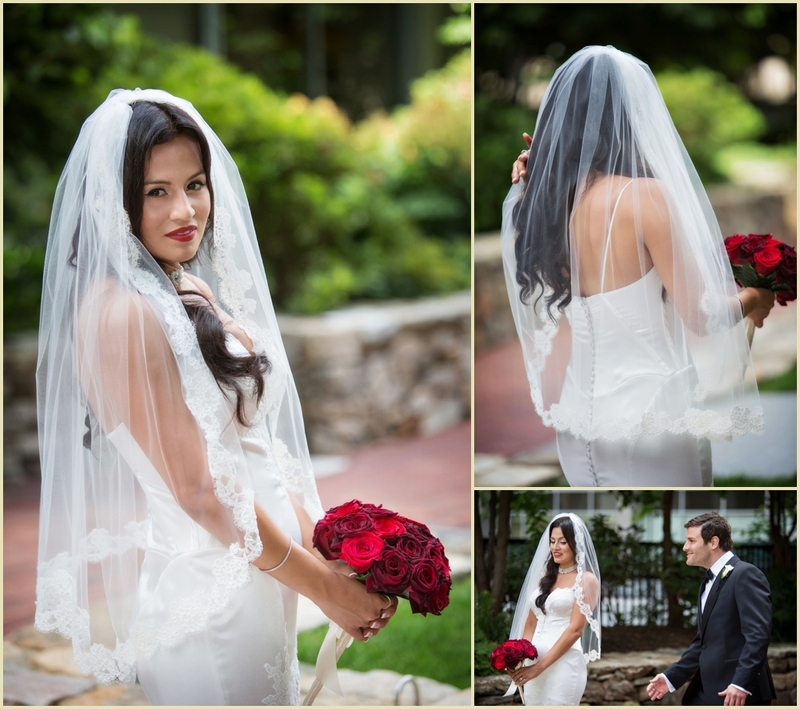 The InterContiental Hotel Boston Wedding of Kendra and Doug was photographed by Person + Killian Photography located at 251 Newbury Street in Boston, MA. 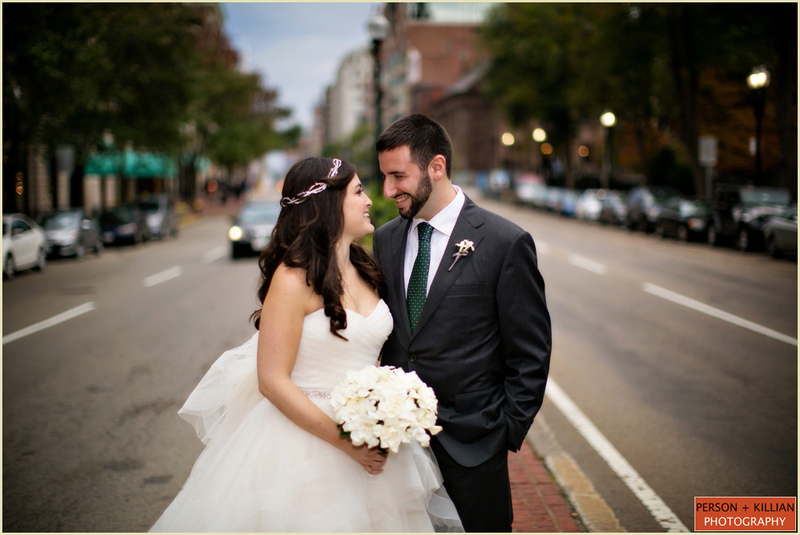 Jill Person and Laurén Killian can be reached via email at [email protected], [email protected] or via phone at 617.236.1662. 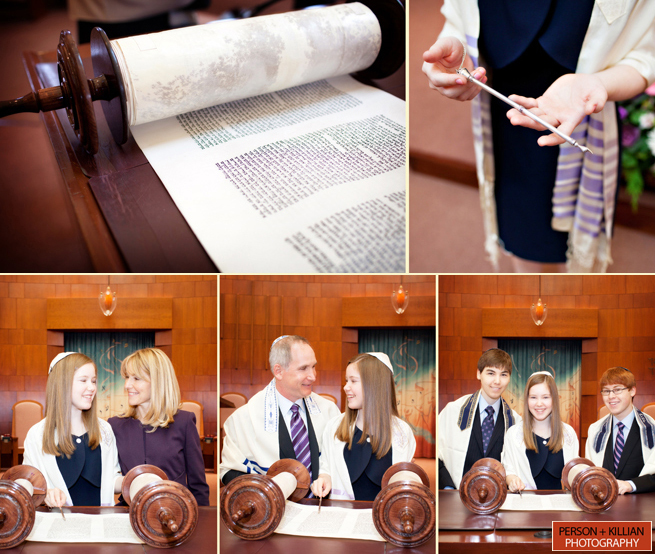 Sam’s Bar Mitzvah celebration started off the Wednesday with some family portraits at Temple Emanuel in Newton. 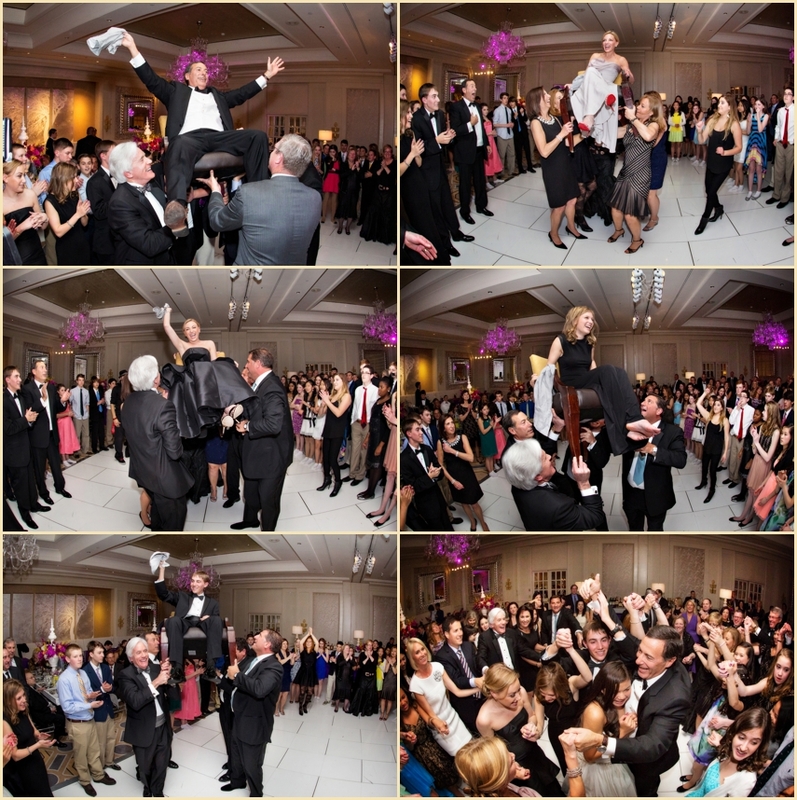 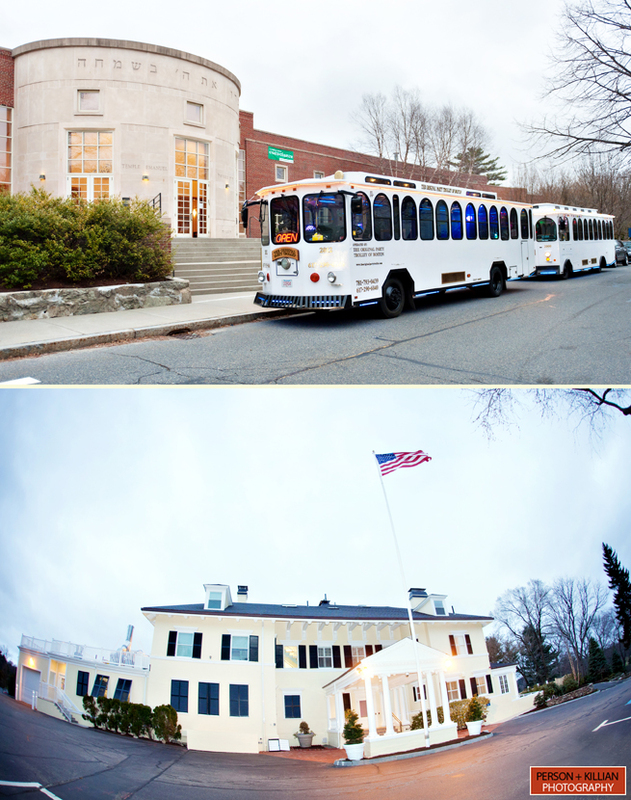 On Saturday after the service, guests were taken on trolleys to Pine Brook Country Club in nearby Weston, MA. 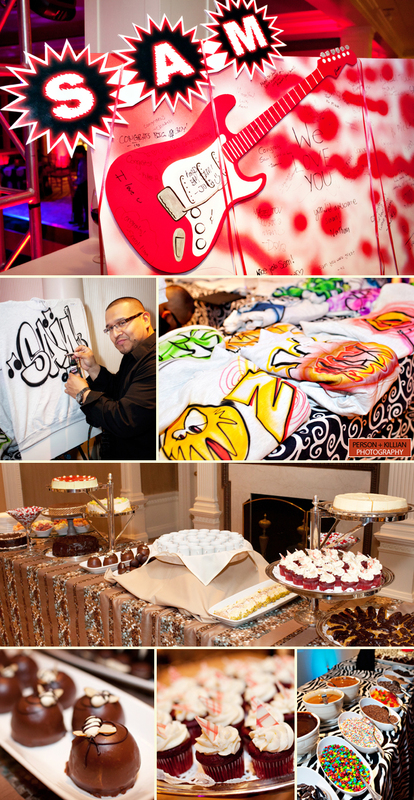 For the kids, it was a rock and roll themed party filled with everything from an airbrush tattoo station to late night ice cream bar and even a dance floor with Sam’s name designed into it. 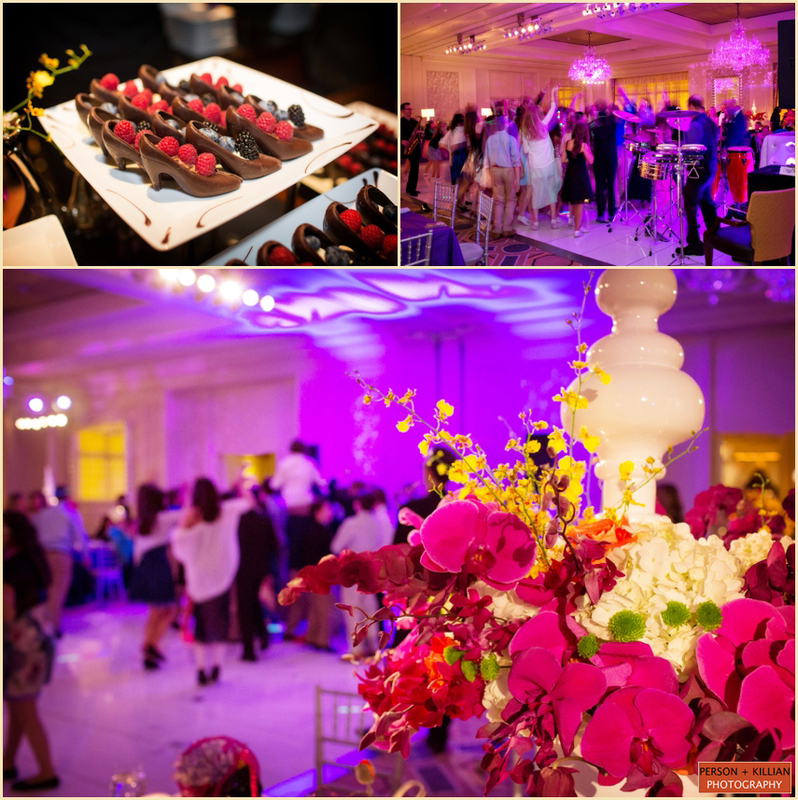 Colors of black and red were interspersed throughout the decor, and electric guitars were seen everywhere from the sign in board to the top of the cake! 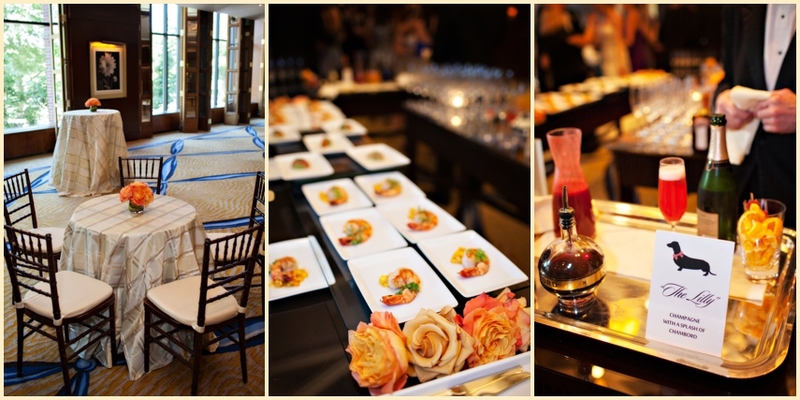 The adults enjoyed cocktail hour in the Living Room followed by dinner in the Grill Room where they were entertained by a live jazz band for the remainder of the evening. 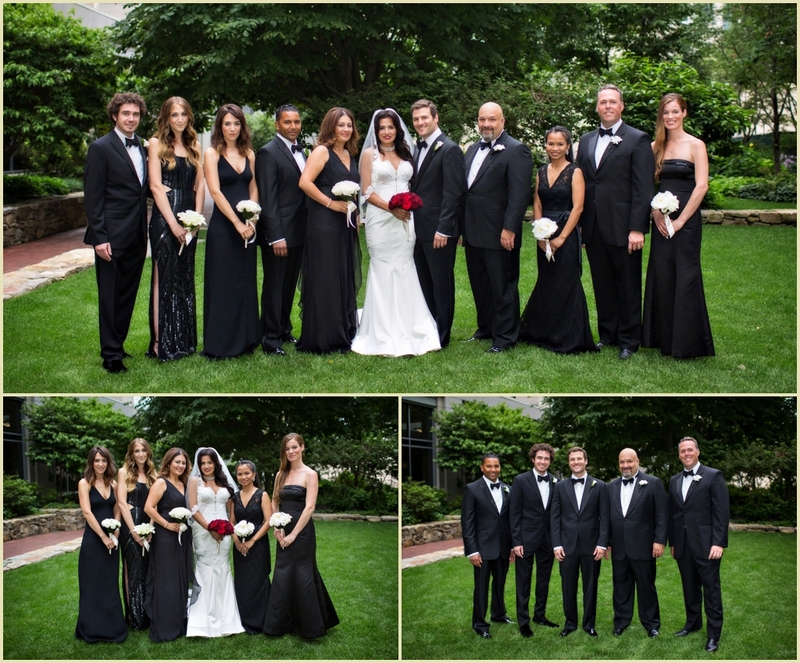 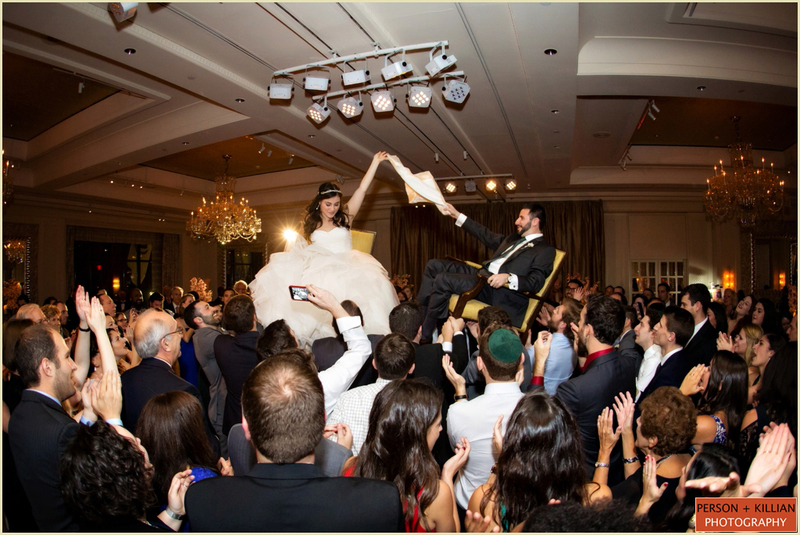 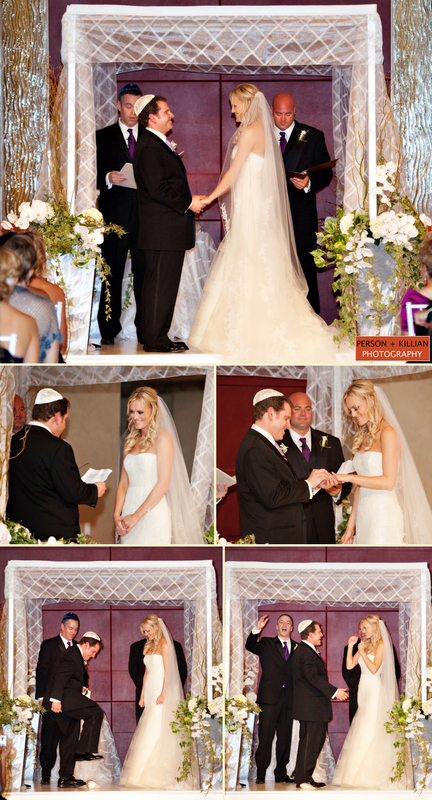 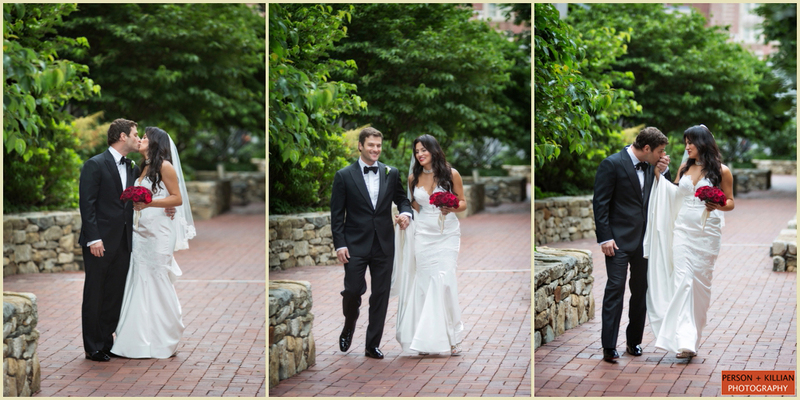 Mazel Tov to Sam and his wonderful family for trusting in Person + Killian Photography to capture these special events. 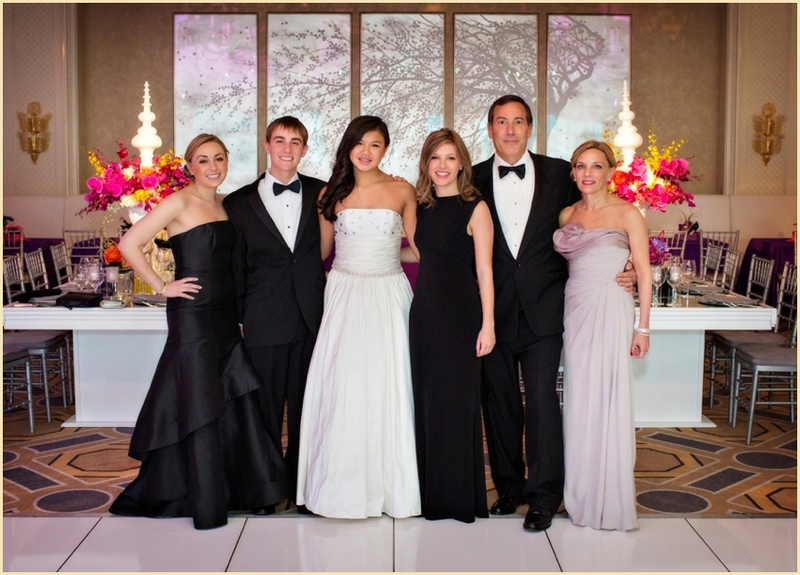 Also, a big thank you to Hopple Popple for sending this great family our way and for creating such a fantastic event! 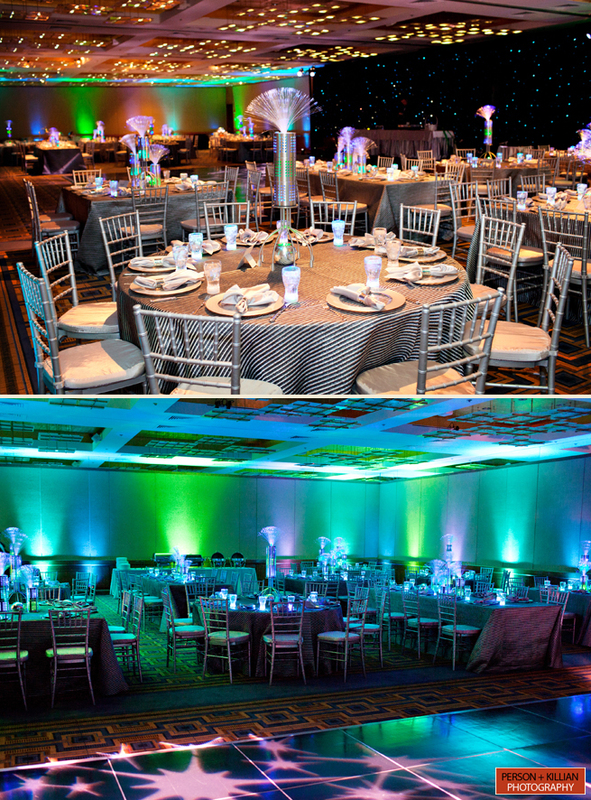 Event lighting and entertainment all coordinated by Hopple Popple. 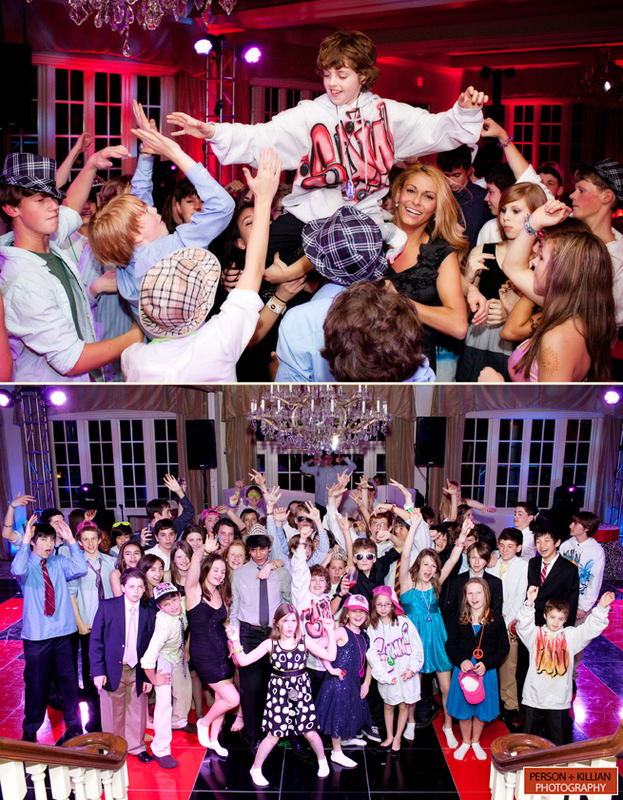 This post is filed under Boston Bar Mitzvah Event Photography at Temple Emanuel in Newton and Pine Brook Country Club in Weston, MA. 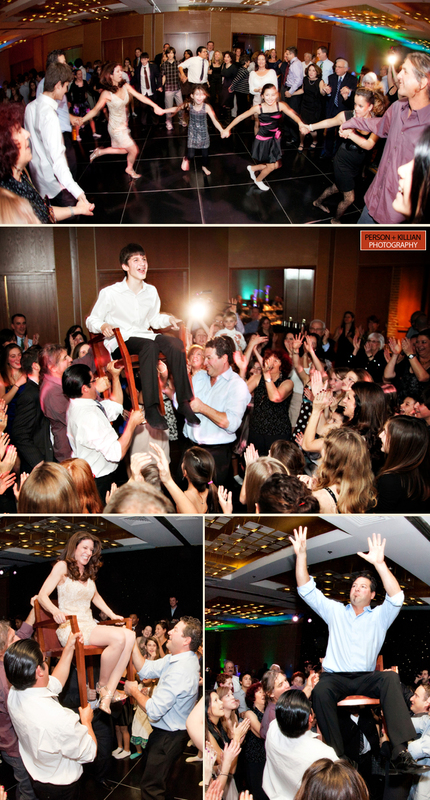 Earlier this month, Person + Killian Photography had the pleasure of photographing both the morning and evening events of Nadav’s Bar Mitzvah celebration at The Charles Hotel. 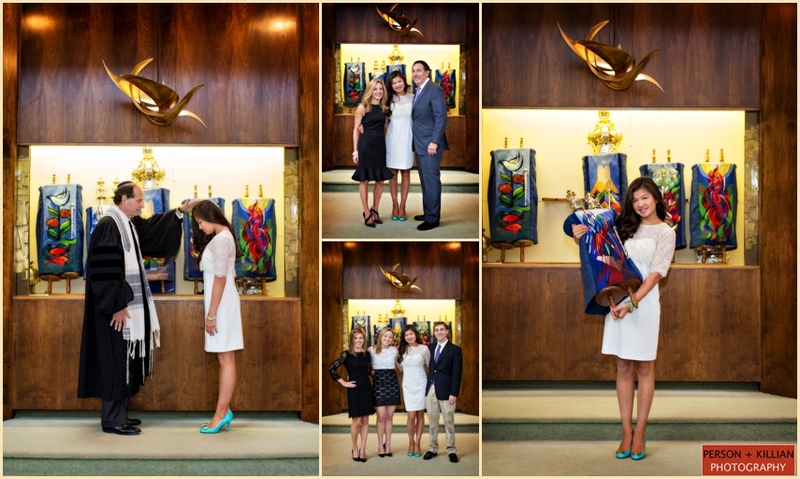 The day started with some family formal photos at Temple Shalom of Newton where we got a sneak peak of the days Kidush luncheon. 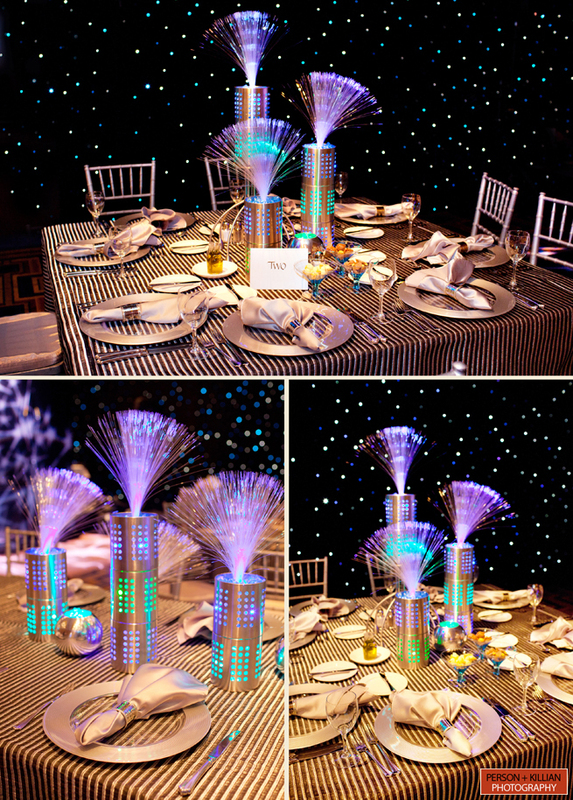 Later that evening it was off to The Charles Hotel in Cambridge where the ballroom was illuminated with blue and green intergalactic lighting that included fiber optic centerpieces and a wall that changed colors throughout the party. 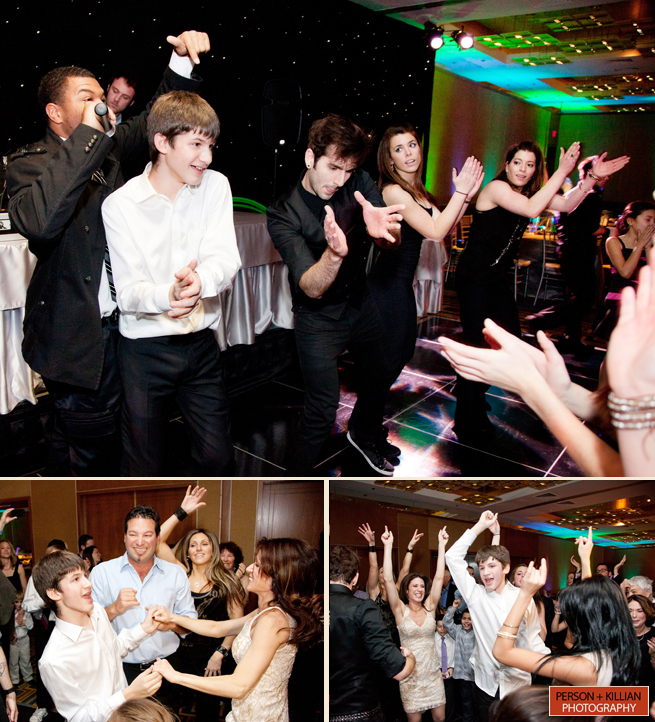 Guests were treated to a multitude of fun activities that included a 16 foot candy bar, popcorn station, photo and video booths and non-stop dancing from the awesome crew at Northern Lights Entertainment. 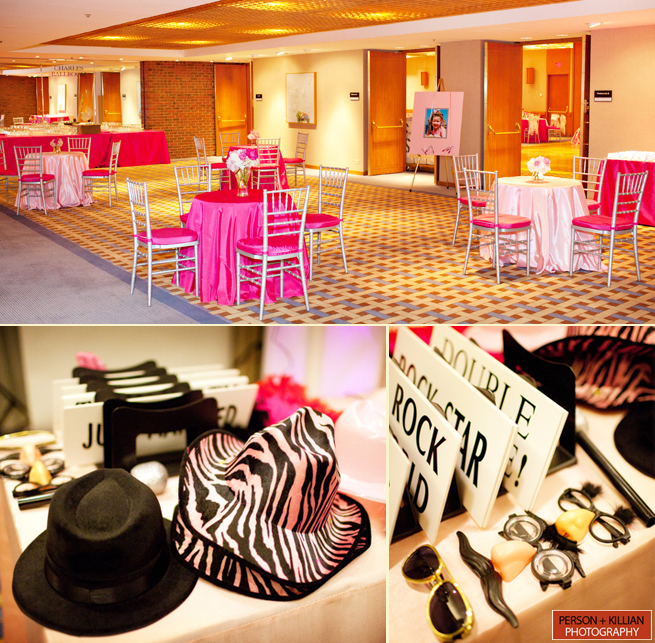 Colorful necklaces, hats, boas, and sunglasses were passed out to all the guests for some fun, goofy pictures of this great celebration! 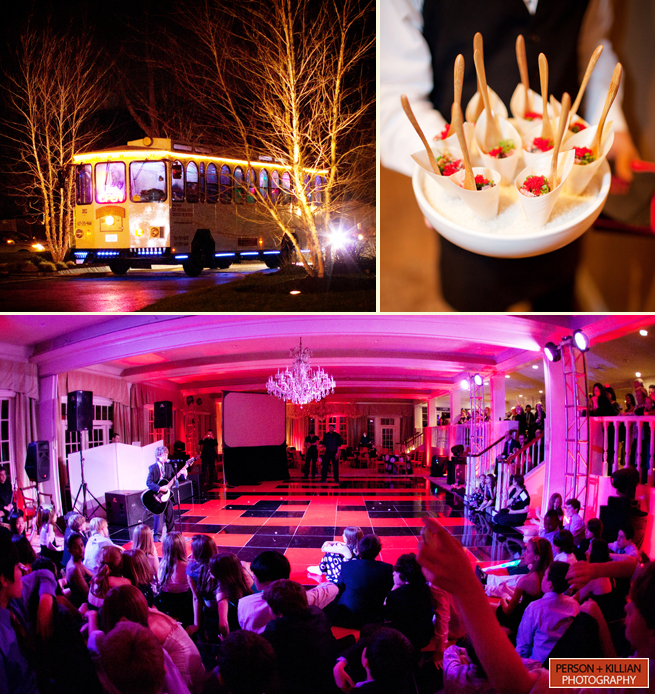 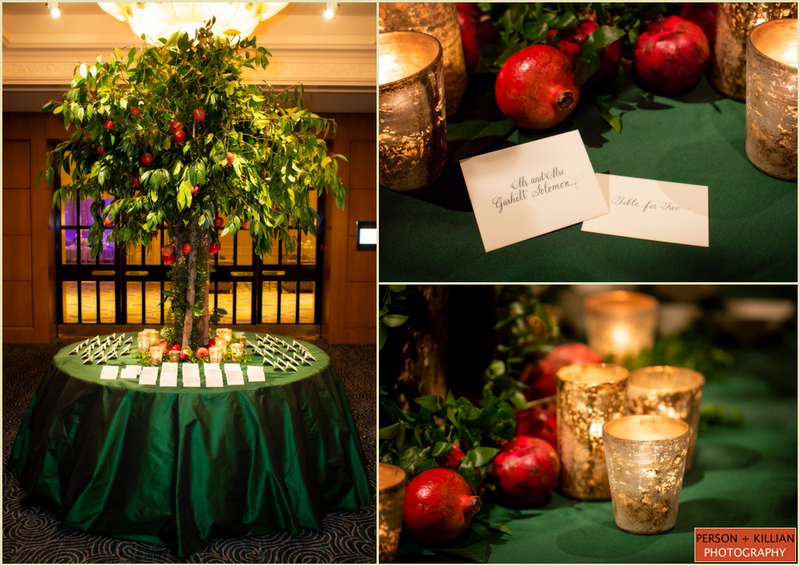 All of the days events were planned and designed by the fabulous team at Hopple Popple. 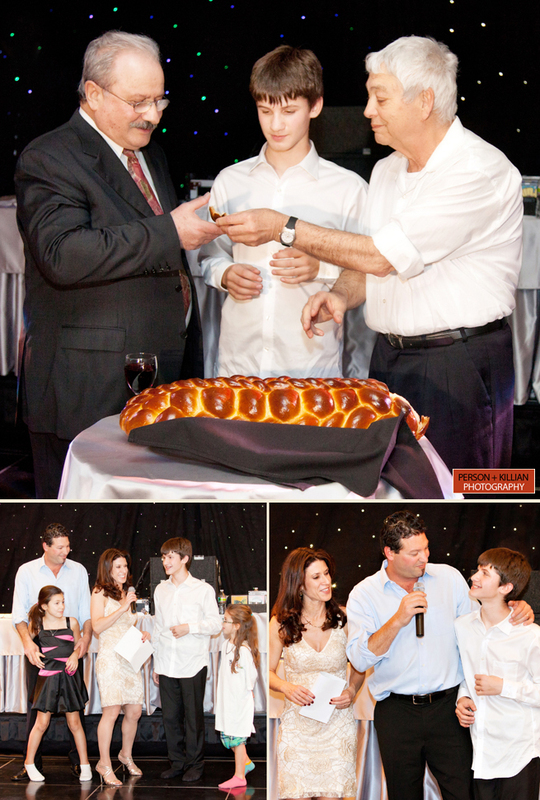 Mazel Tov Nadav! 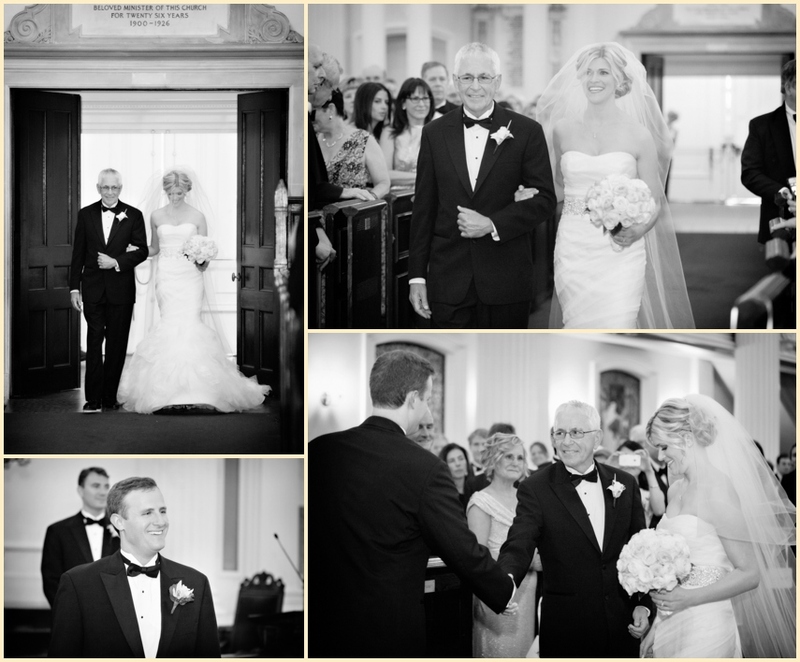 It was a fantastic day and we were thrilled to capture it for you and your wonderful family. 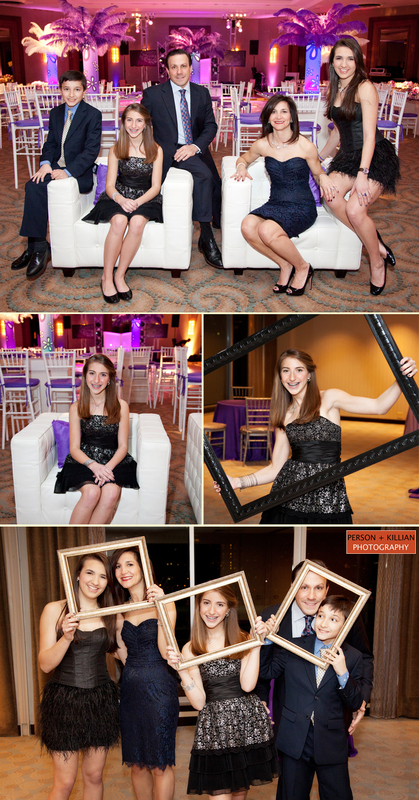 This post is filed under Person + Killian Photography Bar and Bat Mitzvah Photograpy at The Charles Hotel, Cambridge. 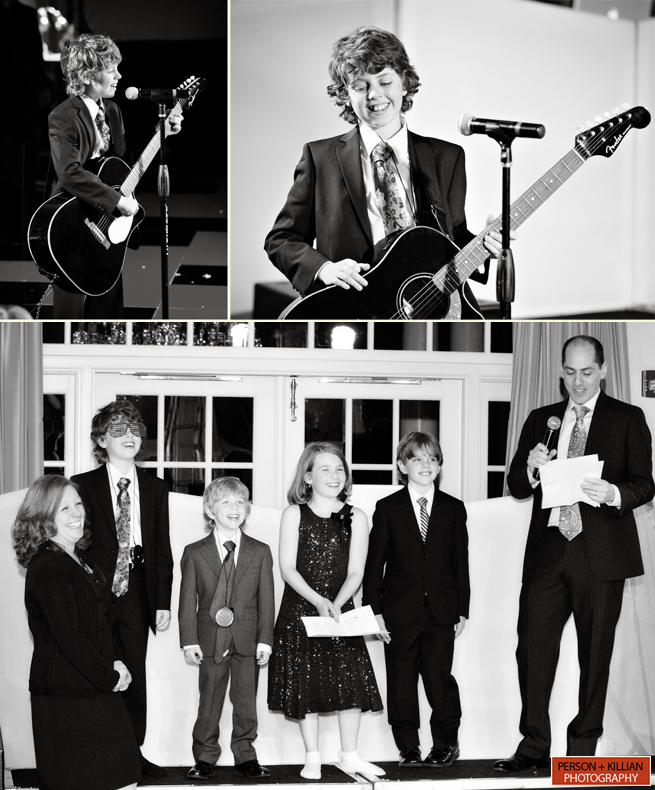 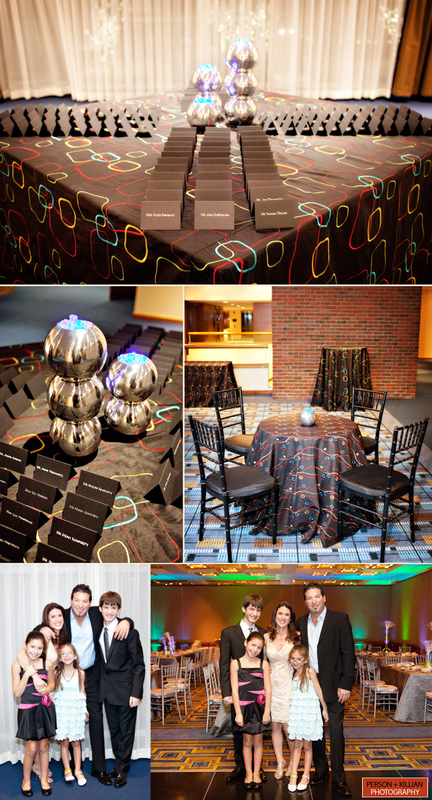 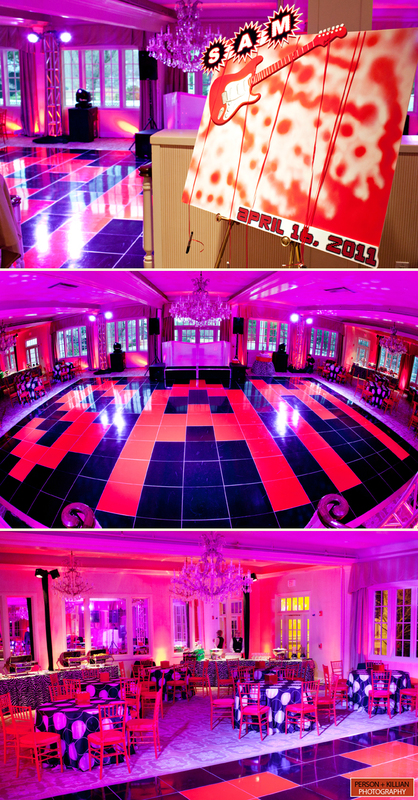 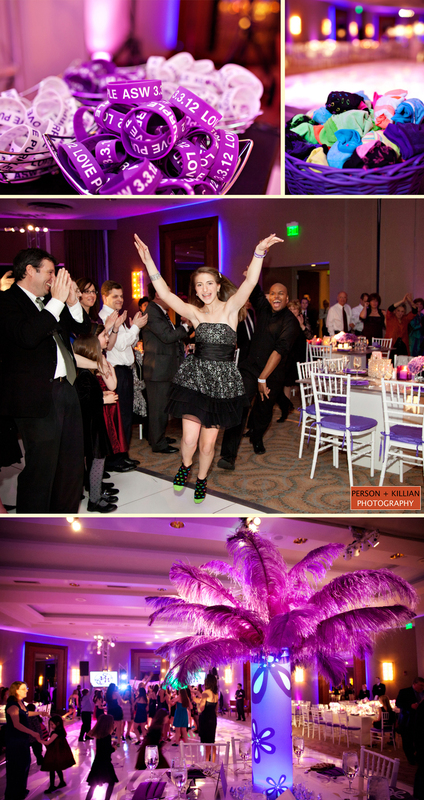 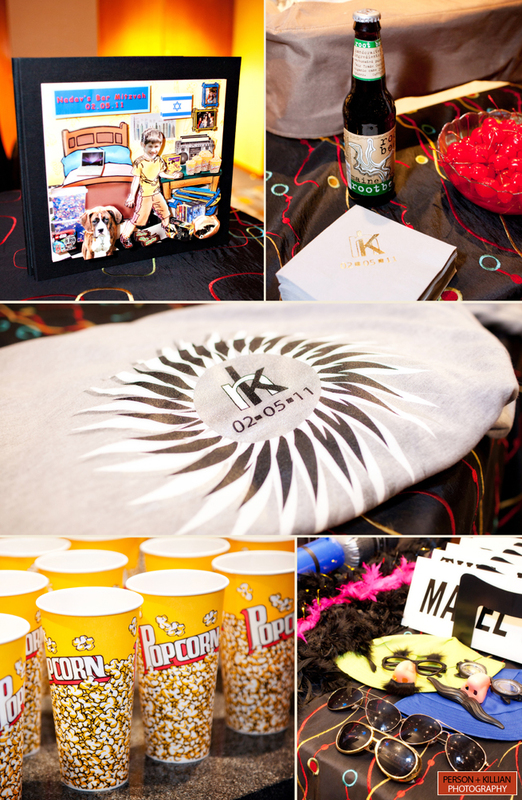 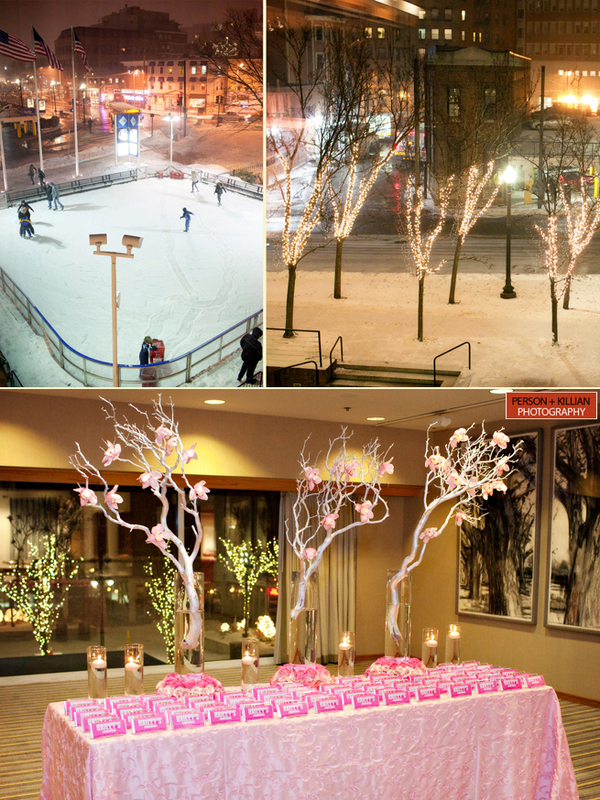 2011 kicked off to a great start for Person + Killian Photography with Hailey’s Bat Mitzvah. 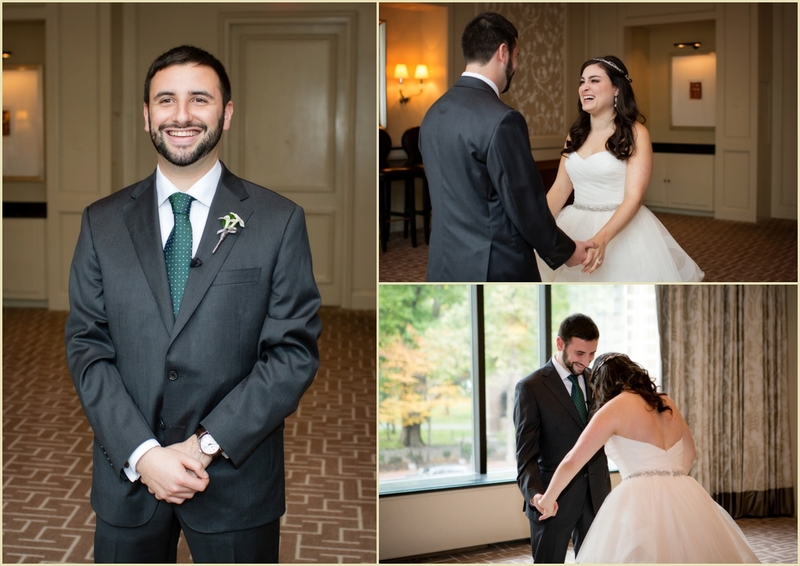 Prior to the reception at The Charles Hotel, we spent some time with Hailey and her family for some formal portraits at Temple Emanuel. 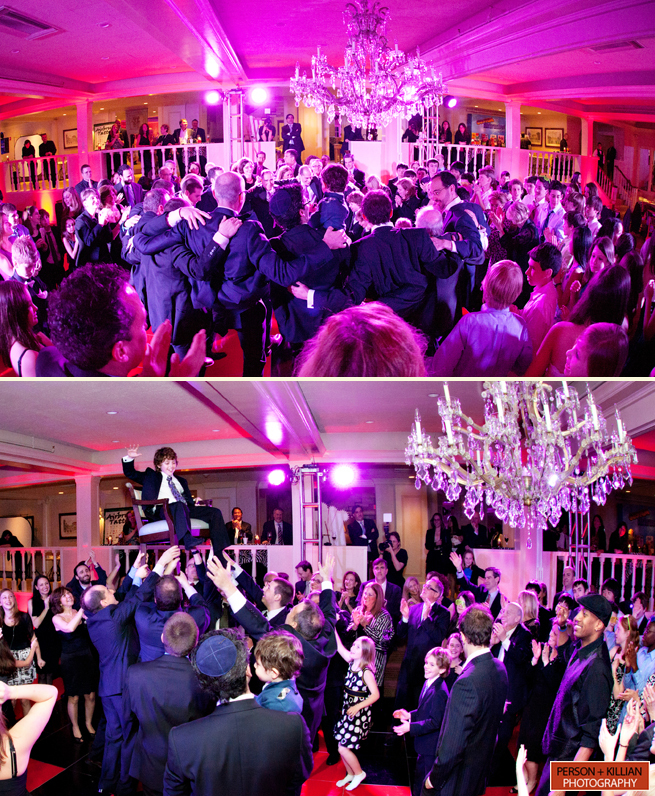 The celebration took place in The Charles Hotel in Cambridge. 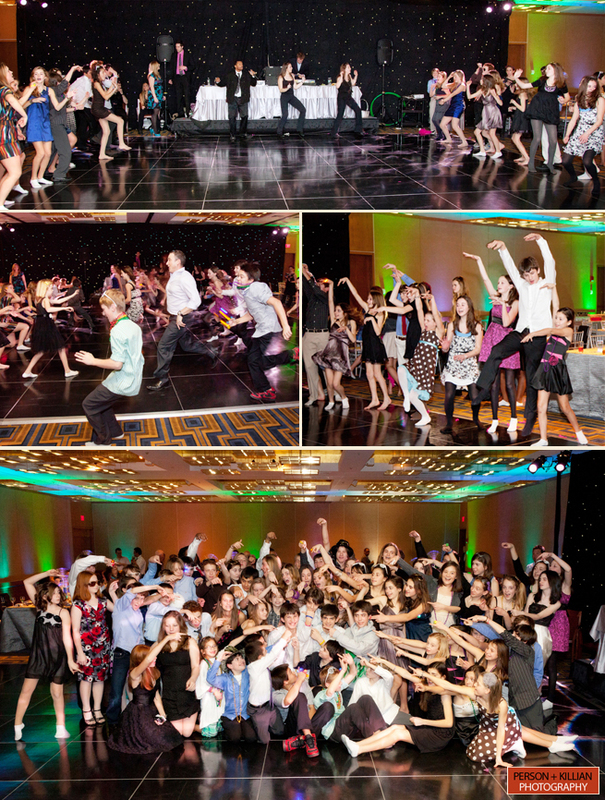 While the adults enjoyed the great view of Harvard Square from the Regatta Bar, the kids were entertained by the dance crew from Northern Lights. 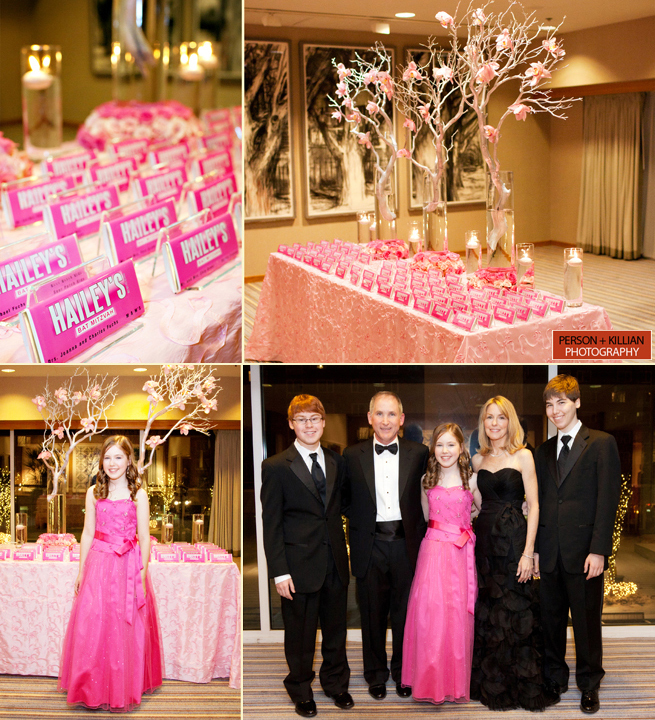 The ballroom was decorated with some of Hailey’s favorite candy that included a giant Hershey’s Bar and Tootsie Roll. 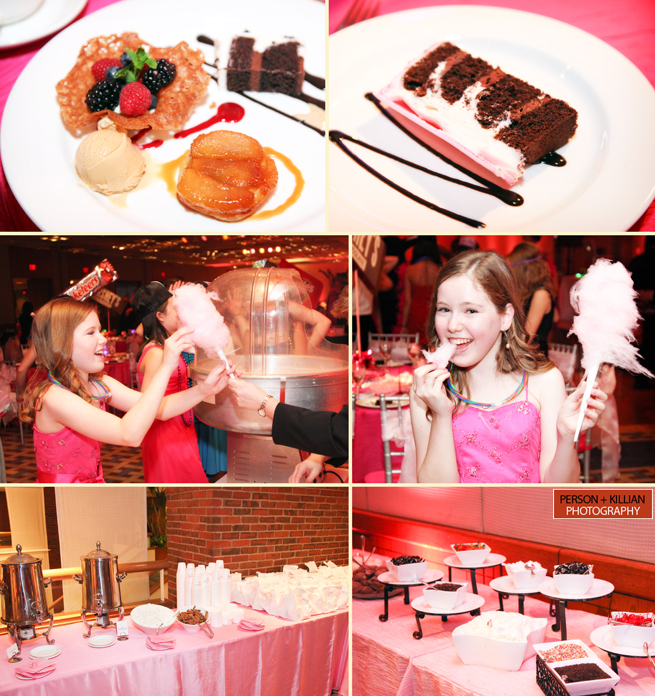 The theme was carried out through the end of the evening and included an ice cream sundae bar, cotton candy station and cider donuts that were a hit with all of the guests. 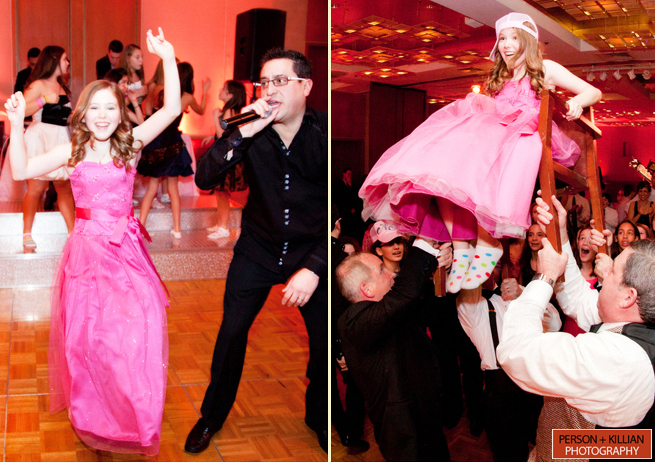 You could definitely tell what Hailey’s favorite color was — pink! 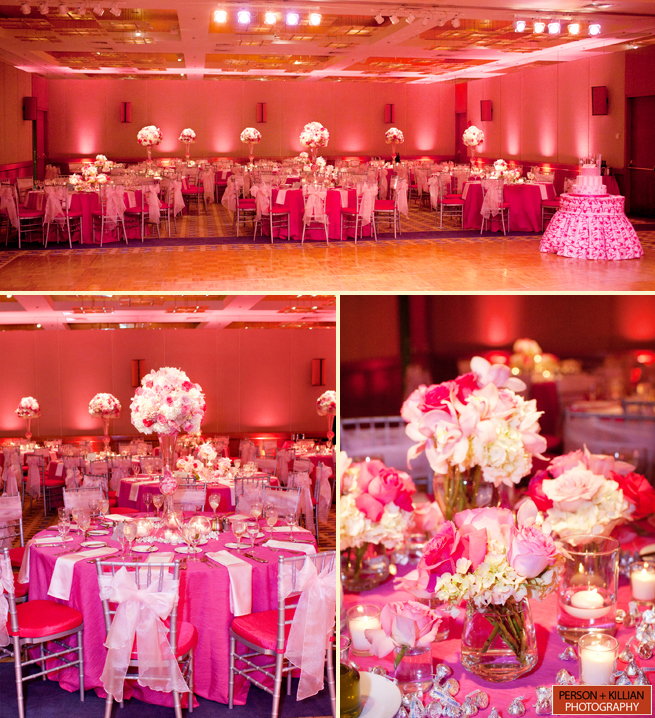 Everything from the chairs to the napkins to the linens, even Hailey’s beautiful dress was a fun shade of pink. 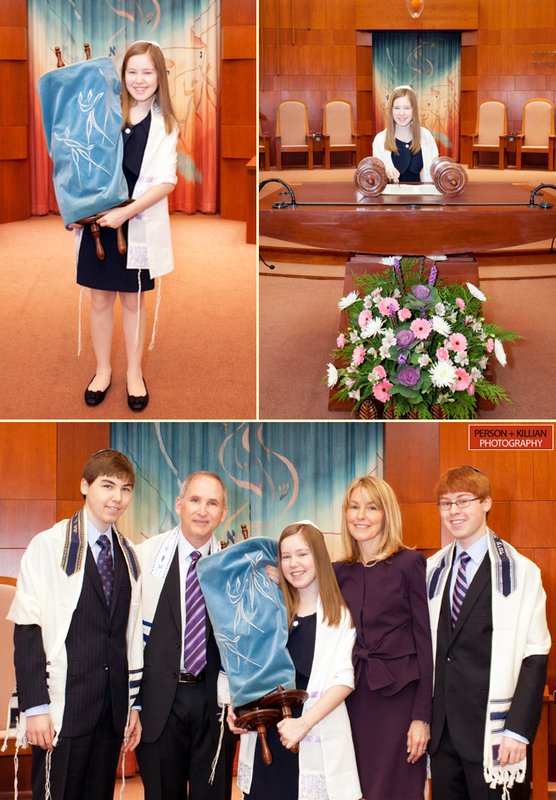 Happy Birthday and Mozel Tov Hailey! 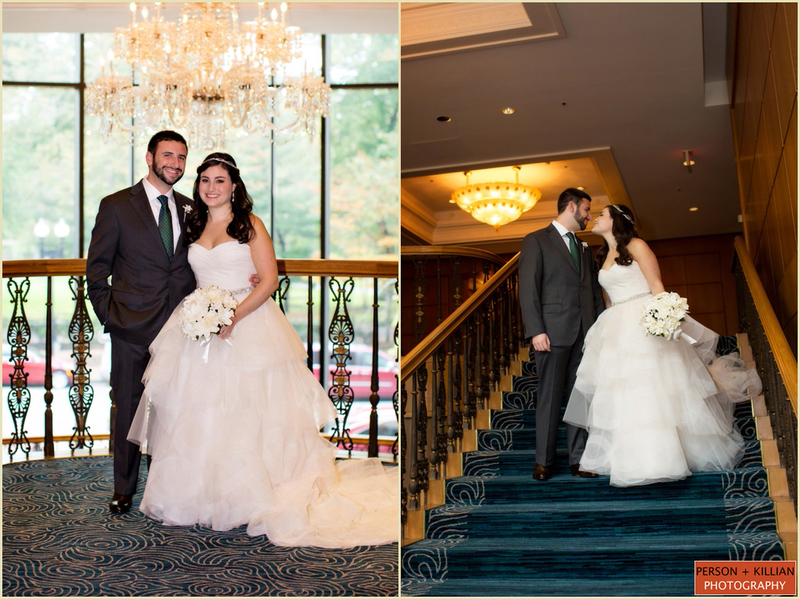 We had a blast capturing your special day.